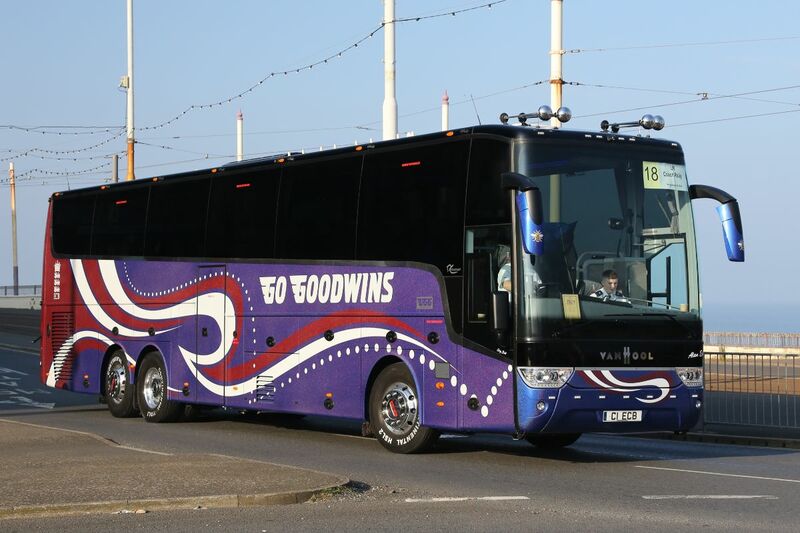 The Goodwin family have been in coaching for over a hundred years and have been competing for the coveted Coach of the Year title at the UK Coach Rally for many of them. 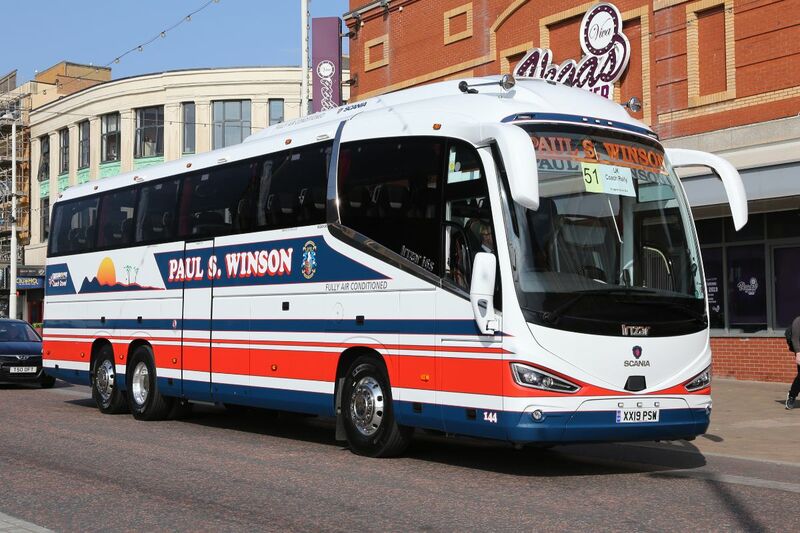 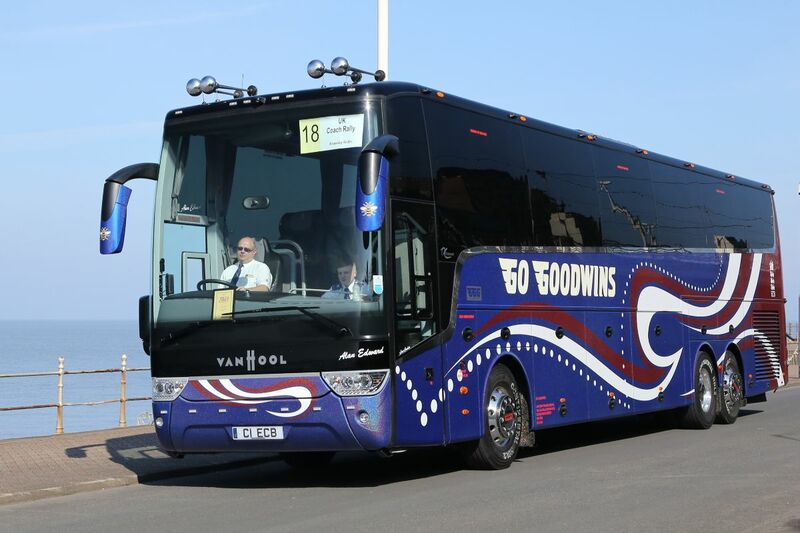 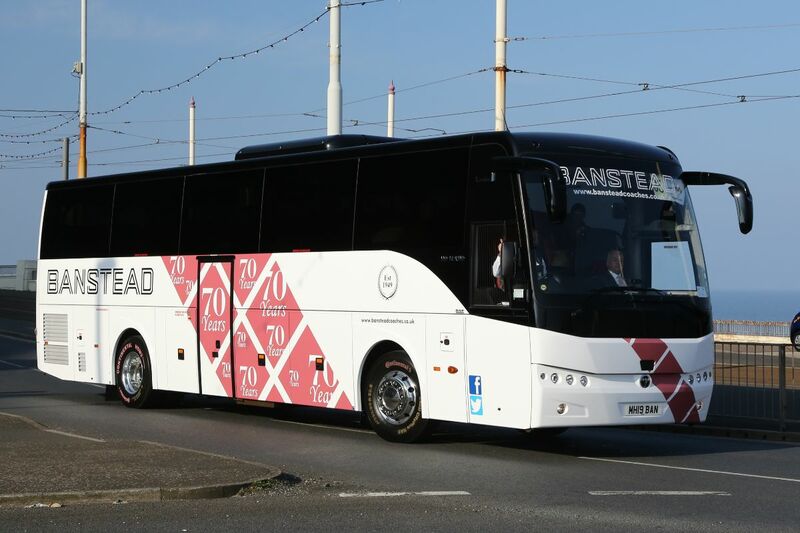 The 65th UK Coach Rally proved to be their event with Geoff and Suzanne Goodwin’s recently formed Go G VIP business receiving the title and trophy for its new Van Hool TDX21 Altano supplied by Moseley (PCV). 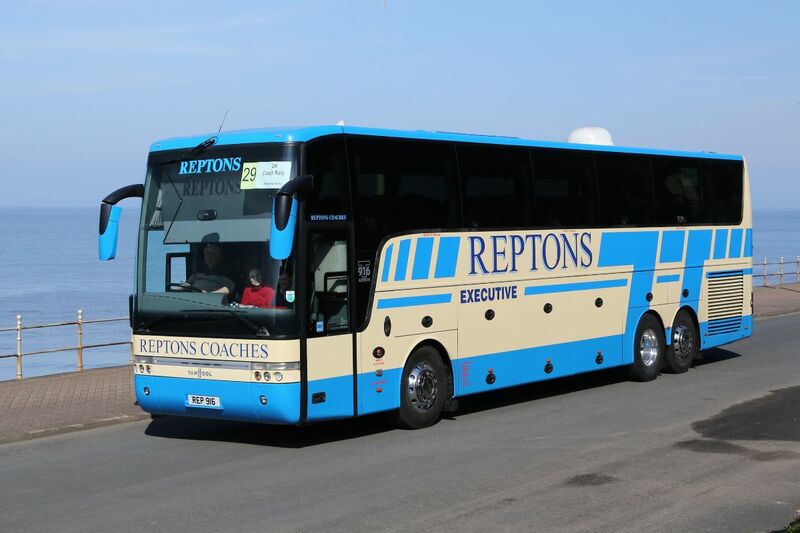 The coach also received the Van Hool Trophy, the Peter Rogers Trophy for top placed CPT member, the John Fielder Memorial Trophy for the top vehicle from a small fleet and the Top Executive Coach Trophy in the awards presentation by Traffic Commissioner Simon Evans. 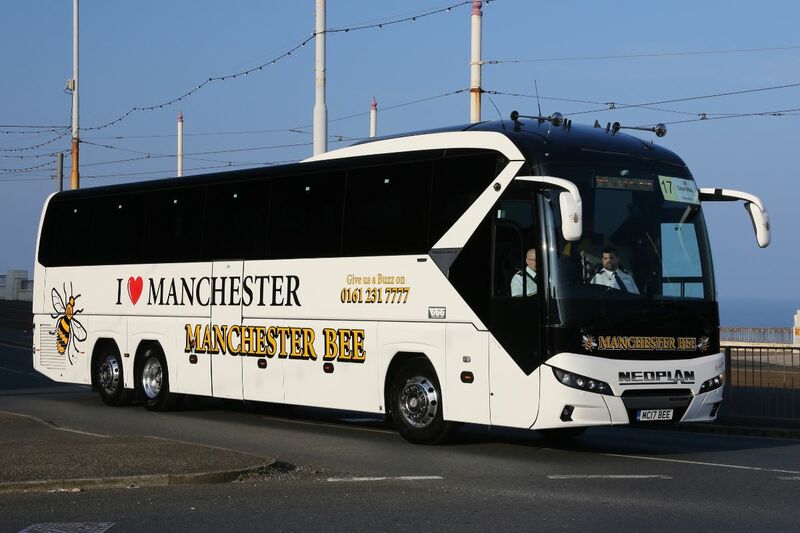 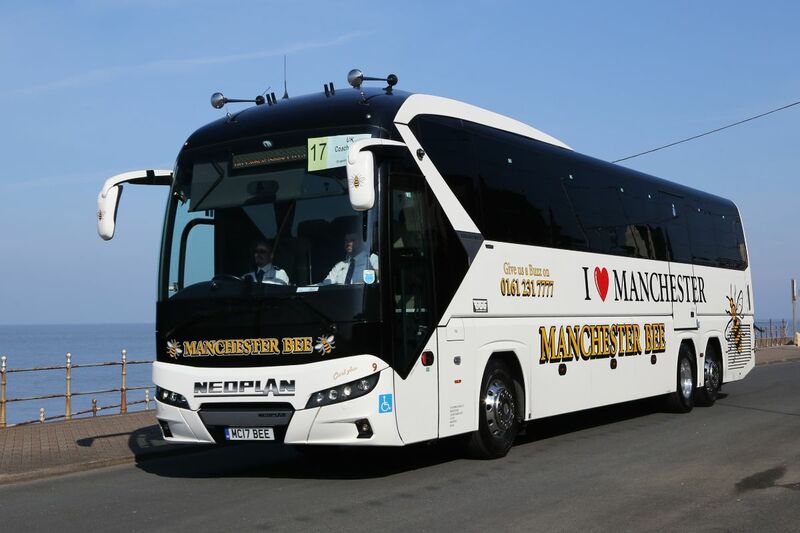 Adding to the family success of the Go Goodwins Group, a tri-axle Neoplan Tourliner from the Go Goodwins Coaches fleet, in Manchester Bee livery supporting that city’s fightback against terrorism, took home both the Neoplan and the Top Standard Coach awards. 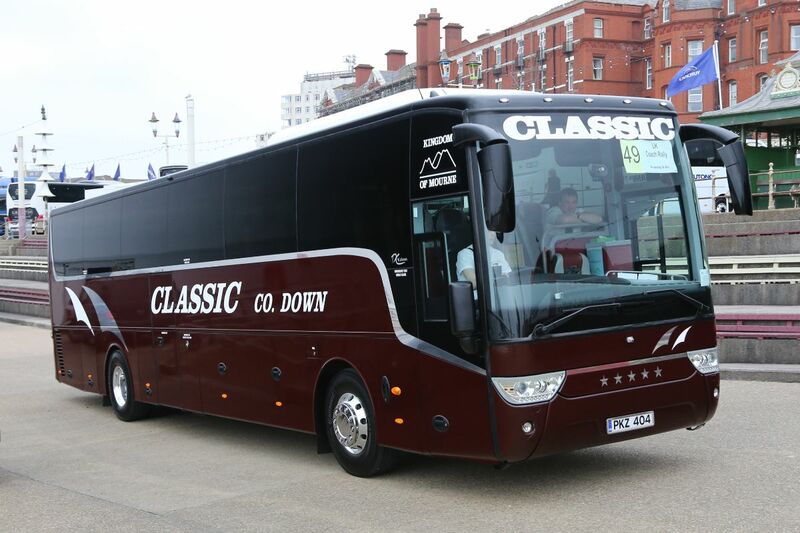 In the other hotly contested overall Concours d’Elegance awards, Plaxton products were to the fore. 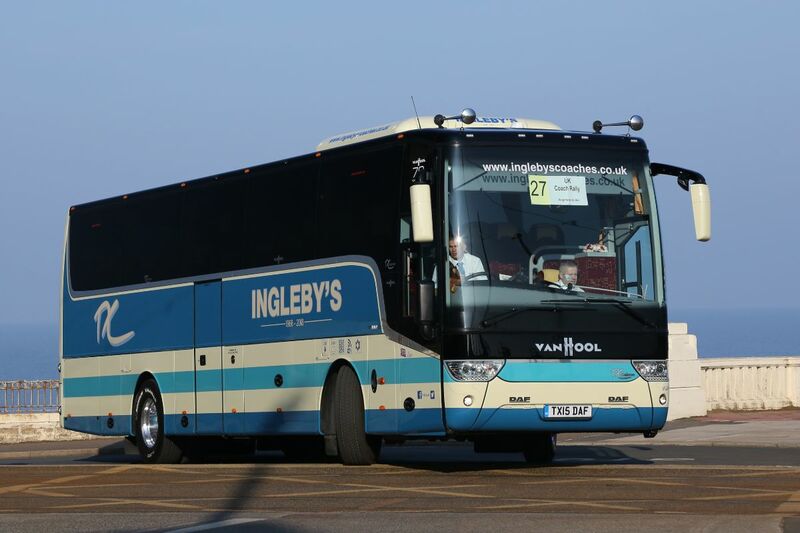 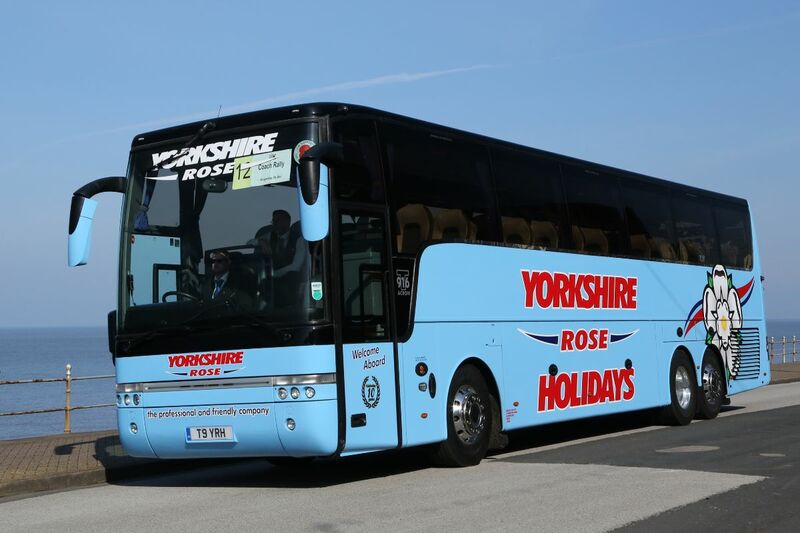 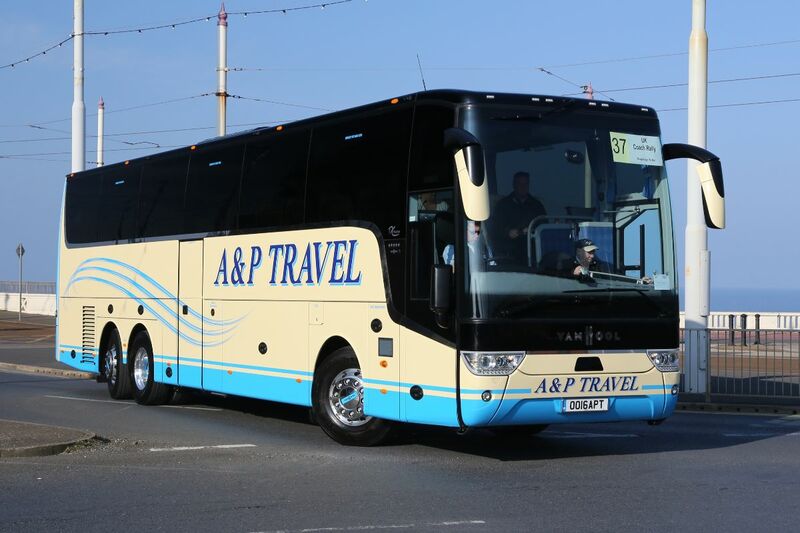 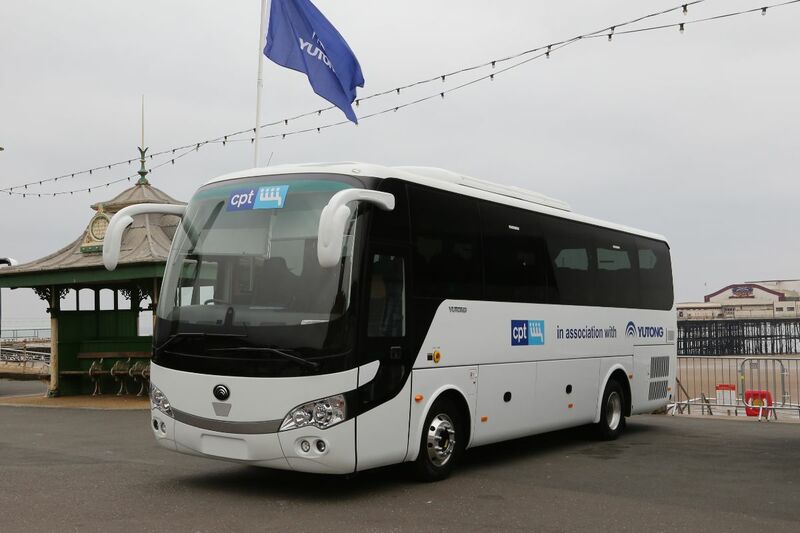 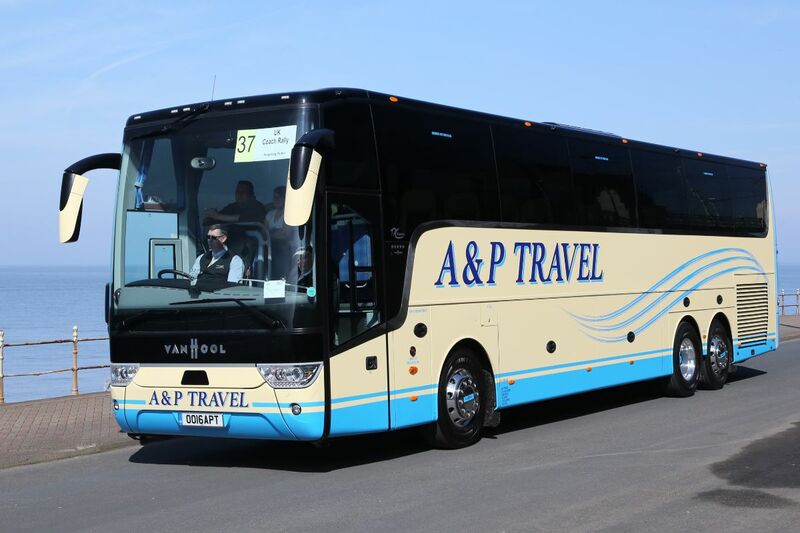 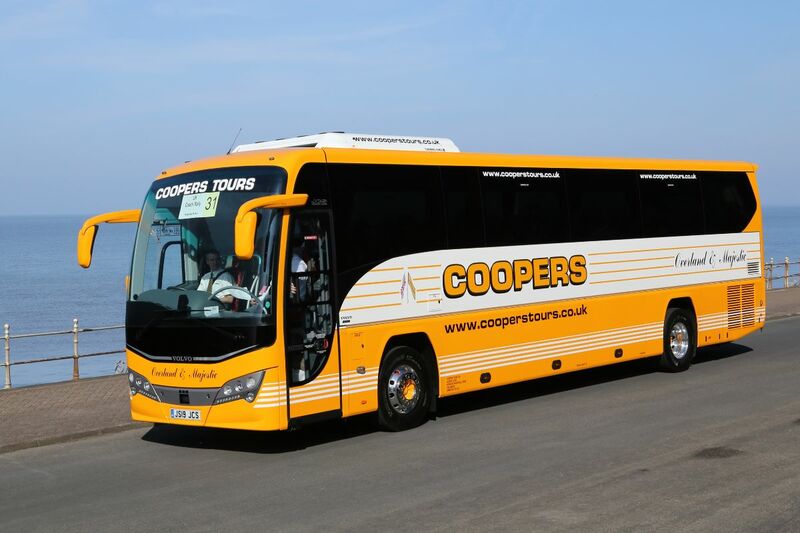 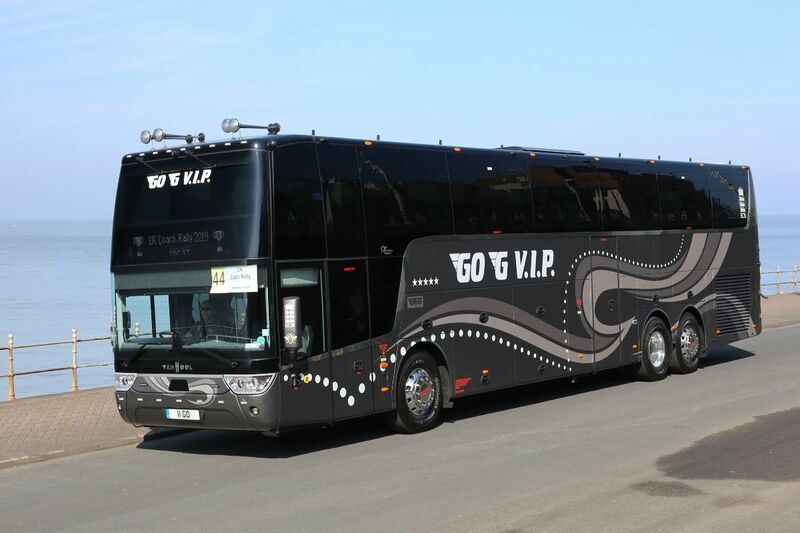 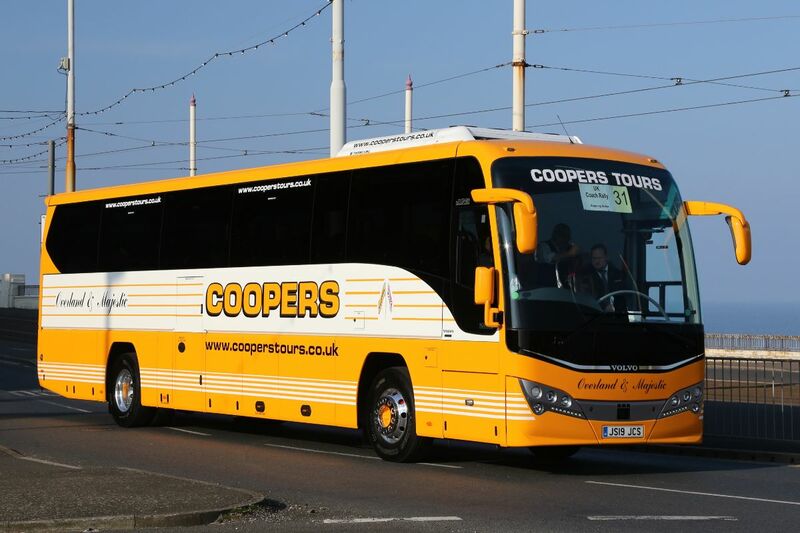 York Pullman company Ingleby’s Luxury Coaches took the Top Mini/Midi award with a Mercedes-Benz Atego-based Cheetah and a Volvo B8R-based Panther added the Top Touring/Express Coach award to Coopers Tours collection. 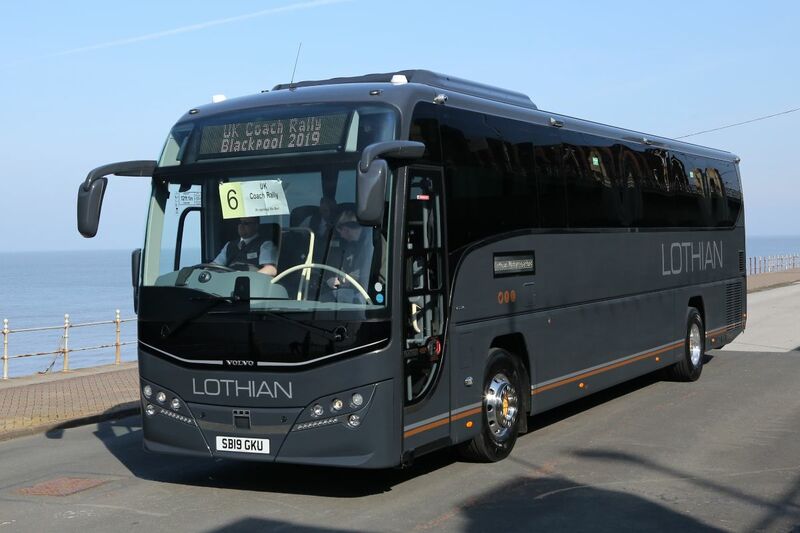 The Plaxton Volvo combination also provided the top coach from Scotland, a new Lothian Motorcoaches B11R Panther and another Plaxton was the steed for the winner of the Director’ Challenge. 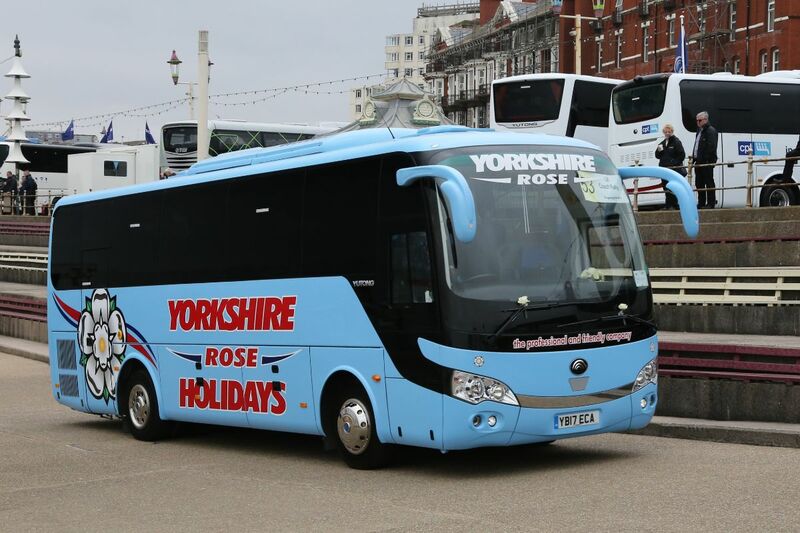 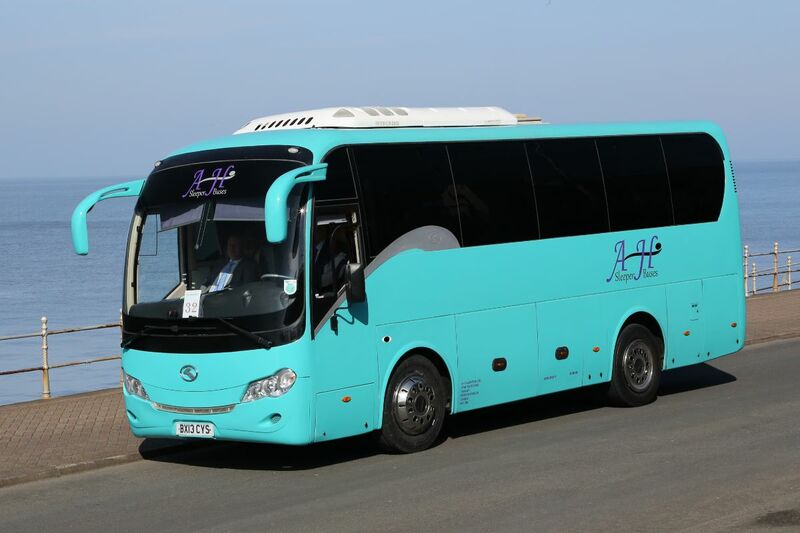 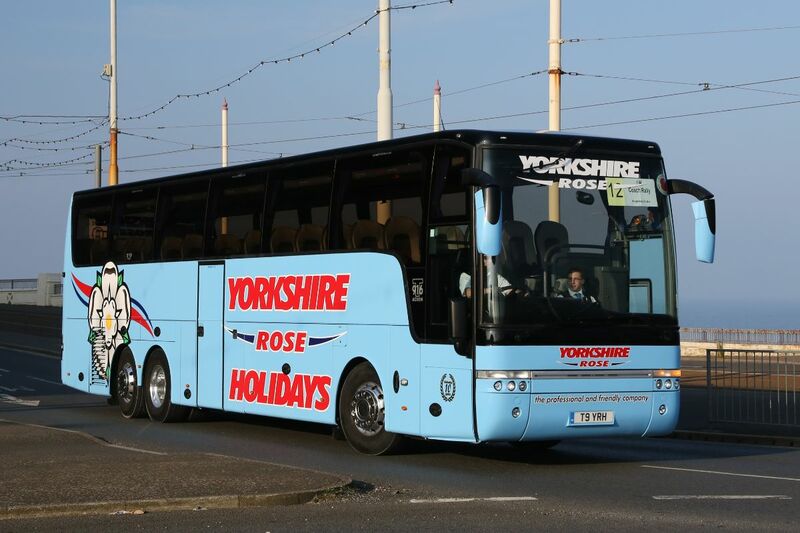 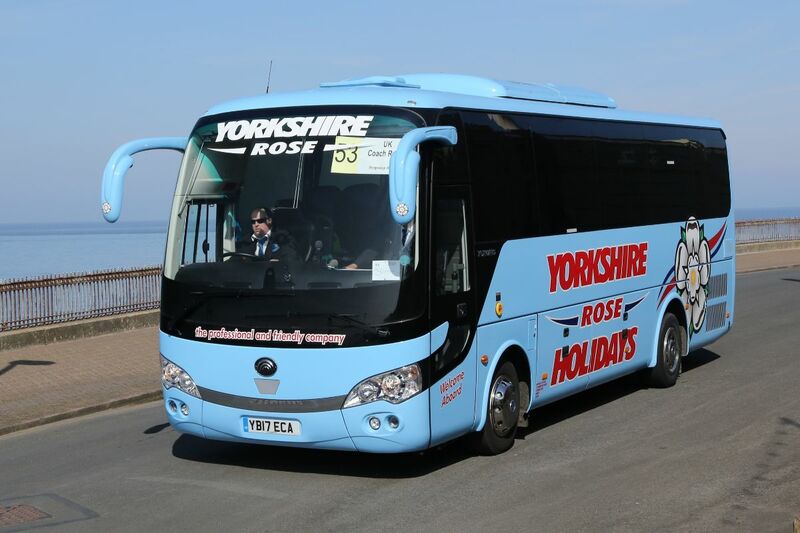 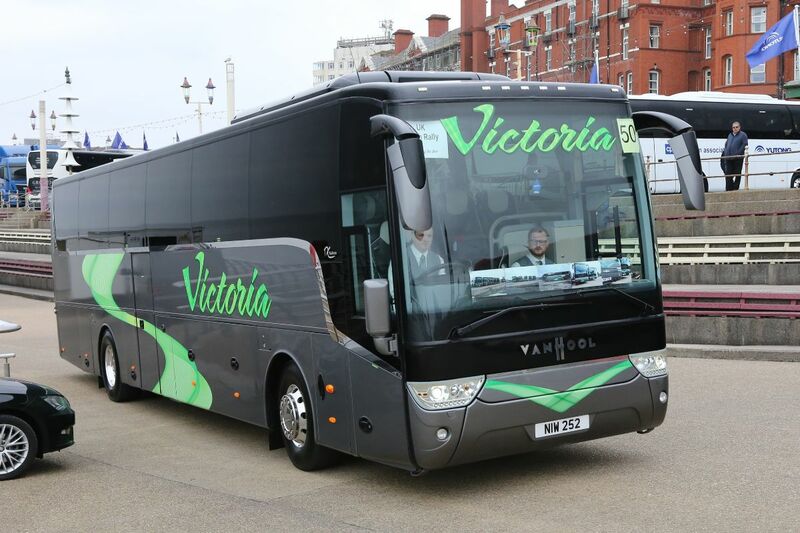 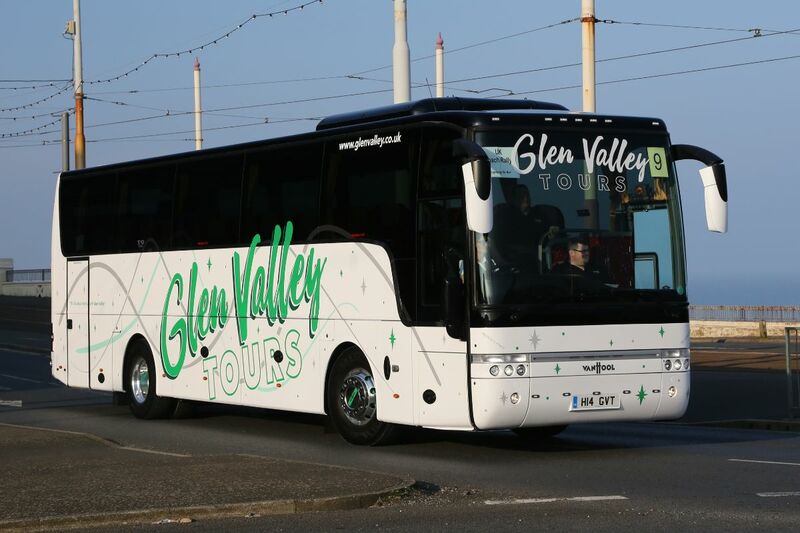 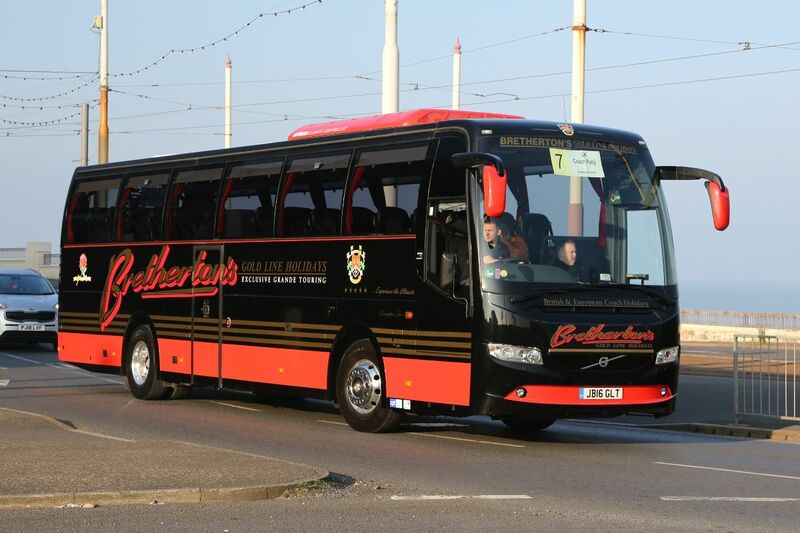 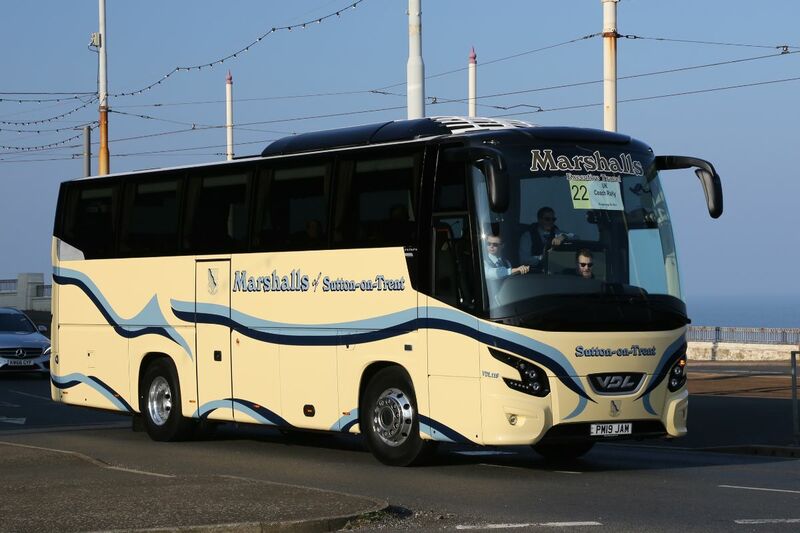 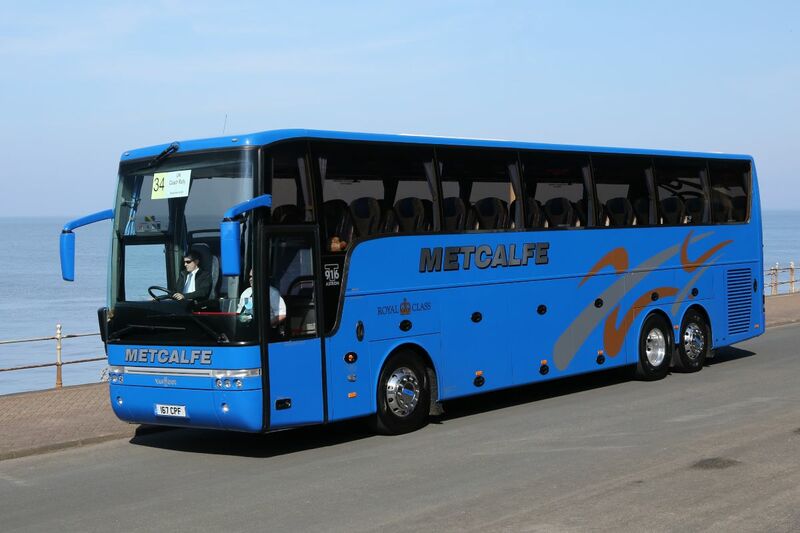 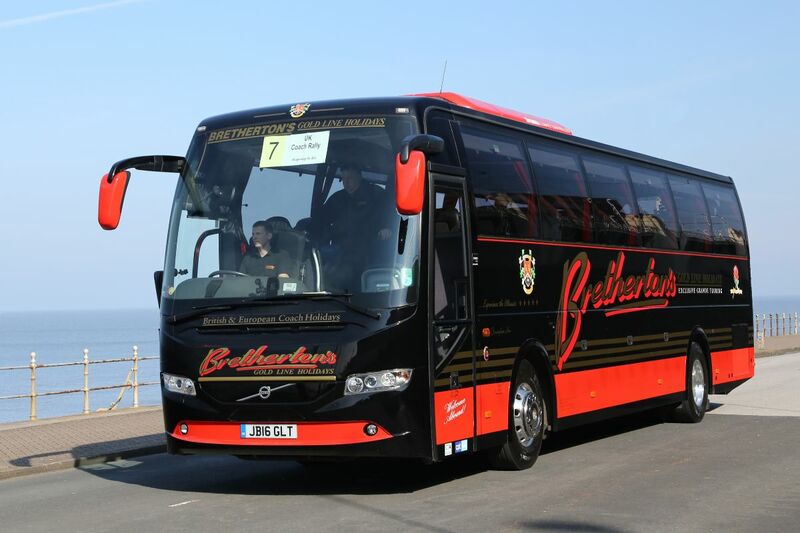 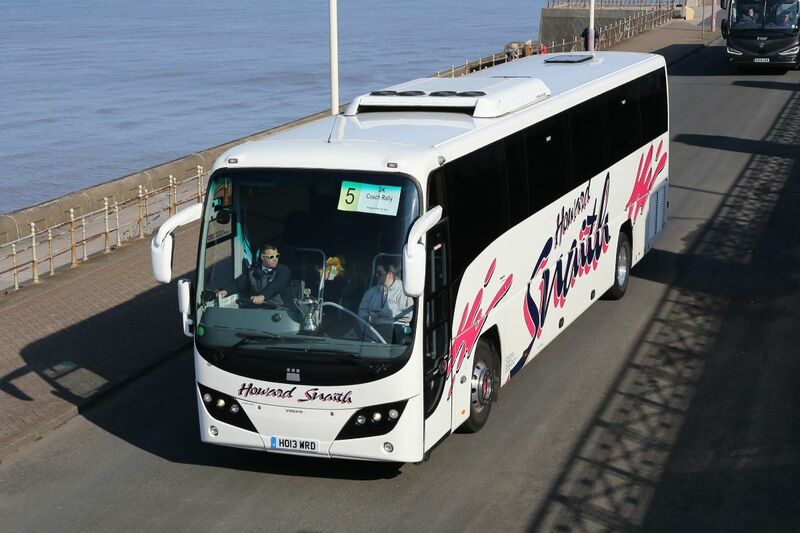 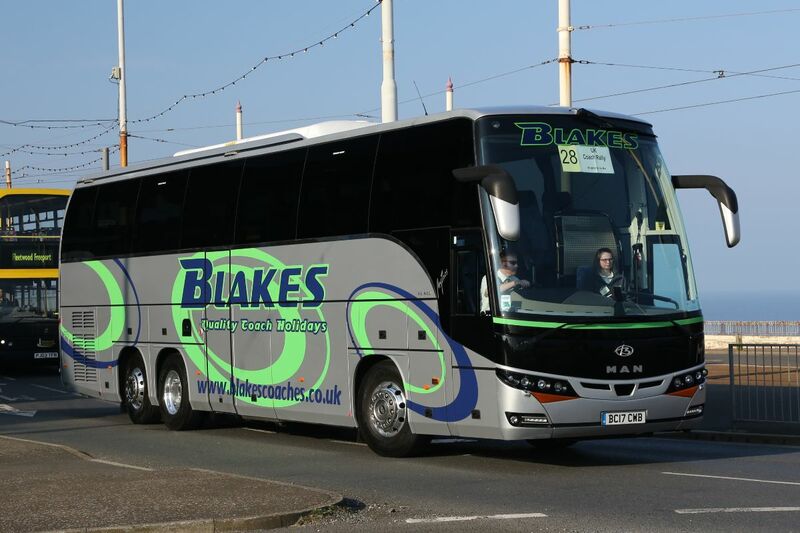 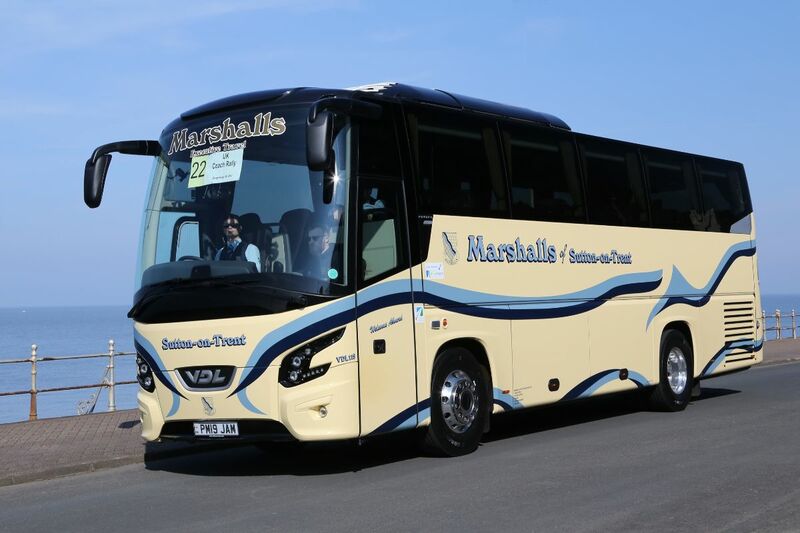 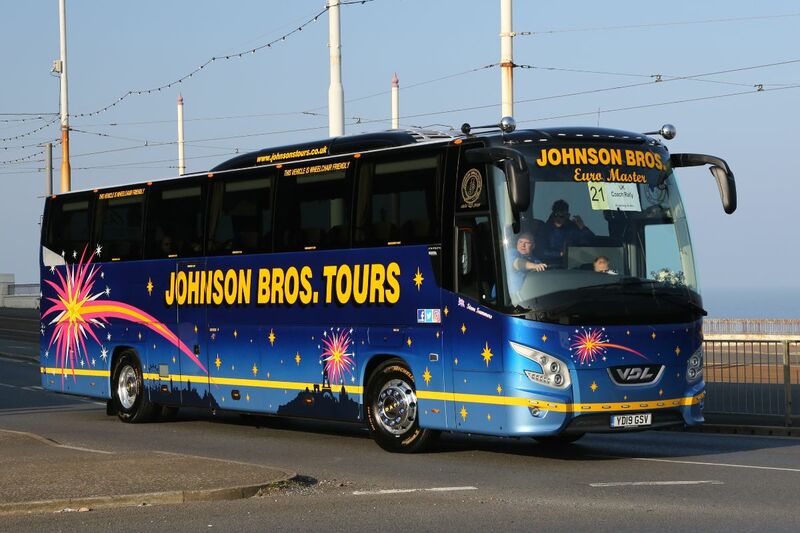 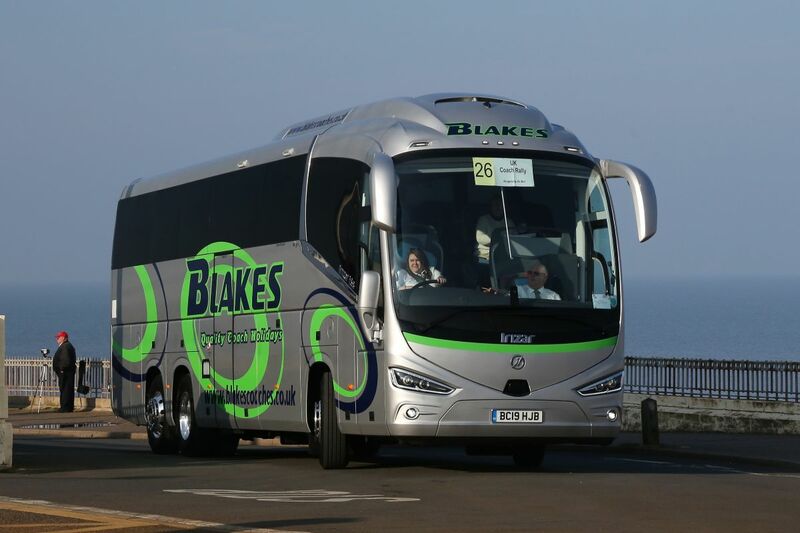 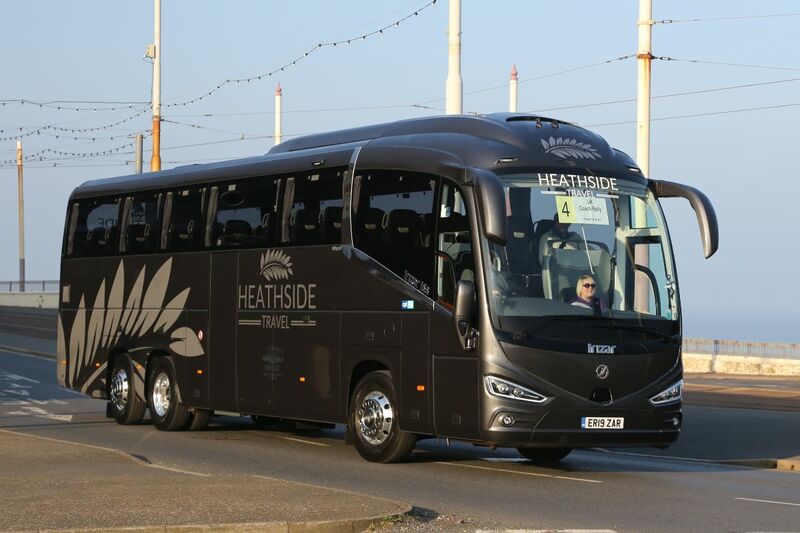 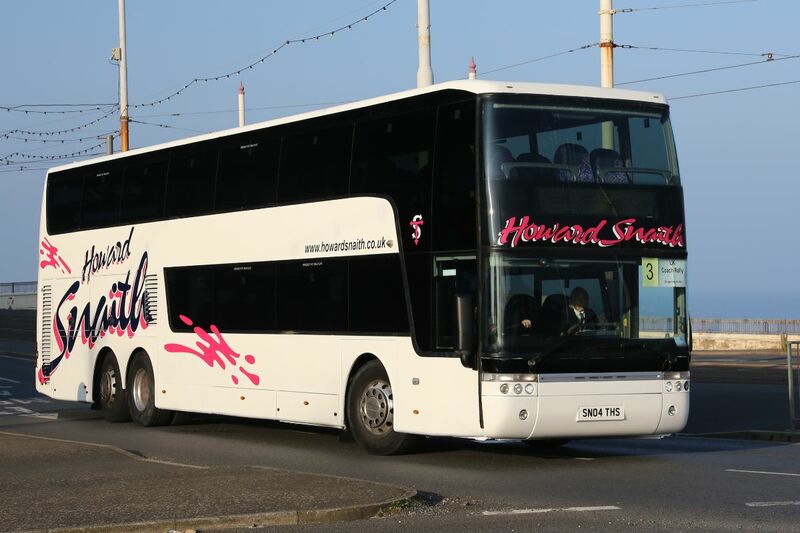 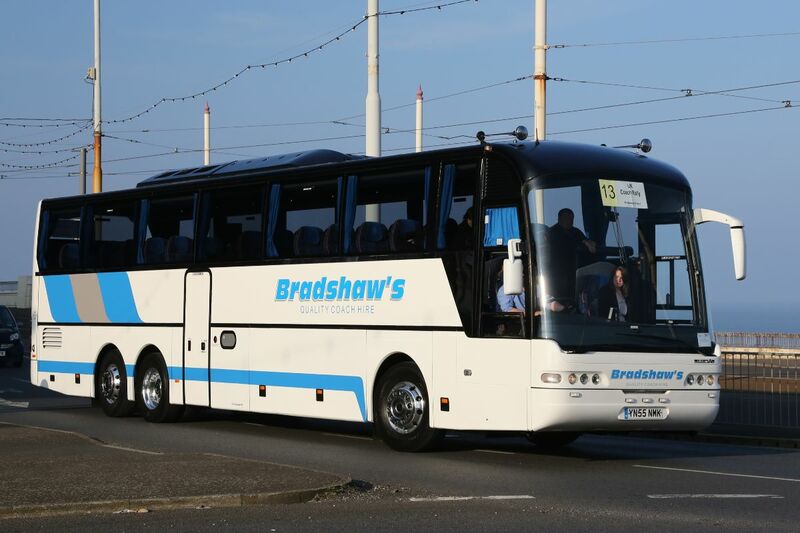 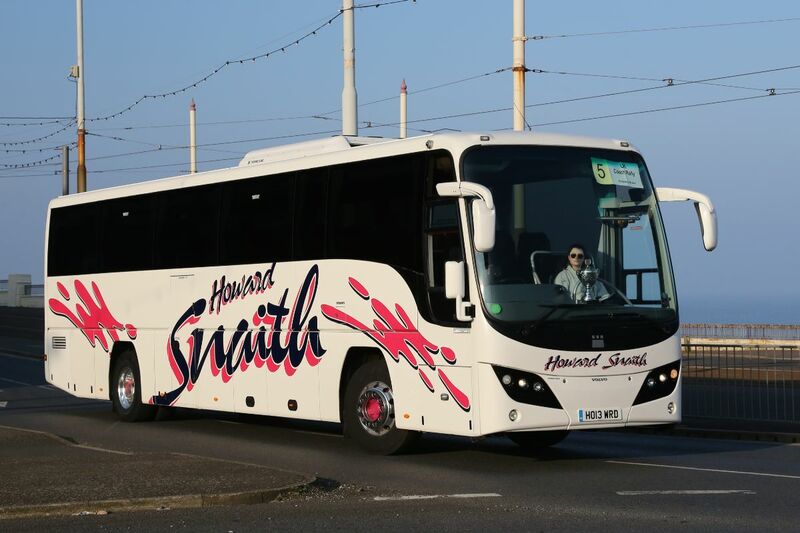 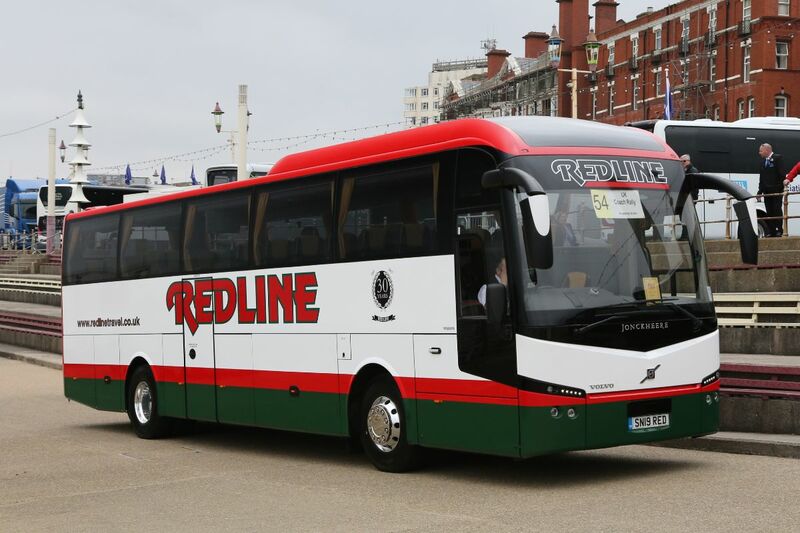 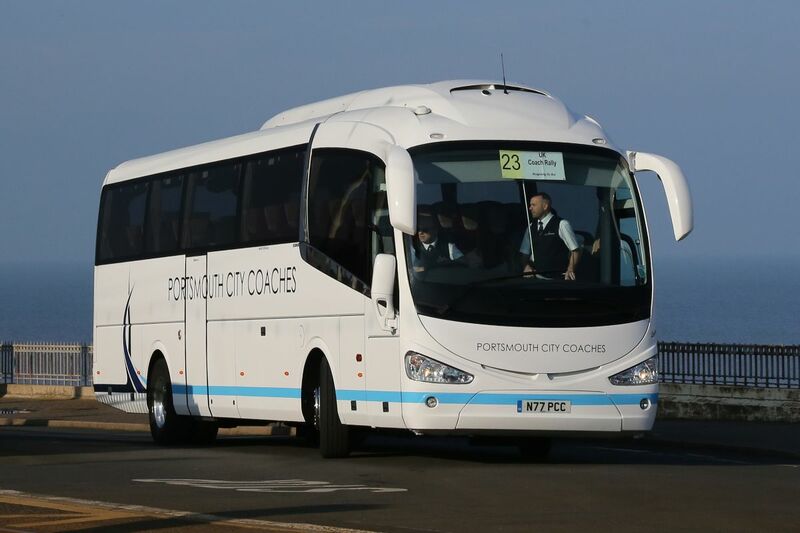 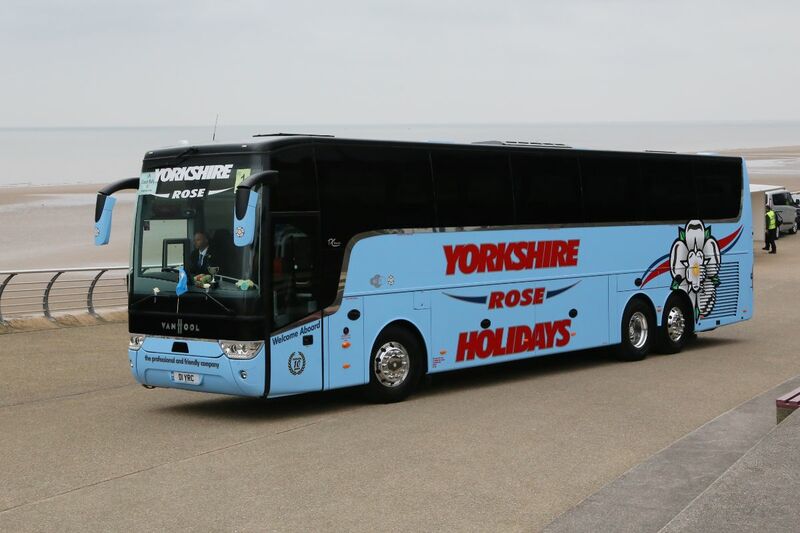 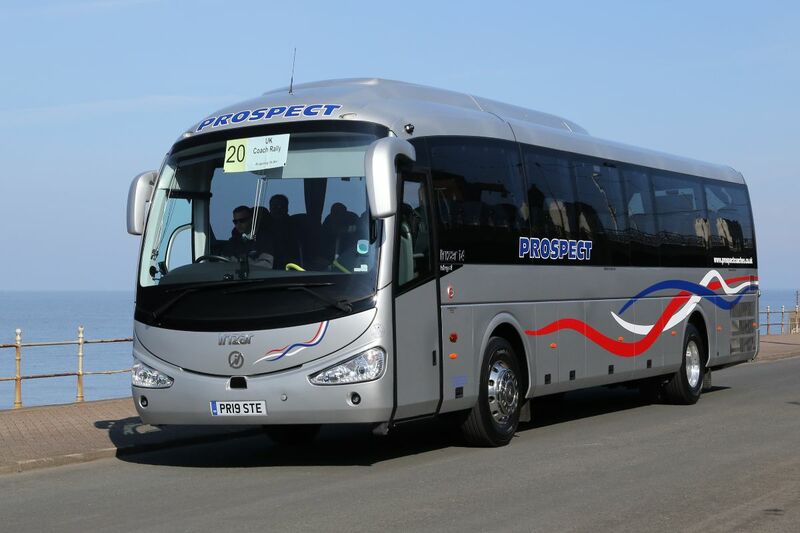 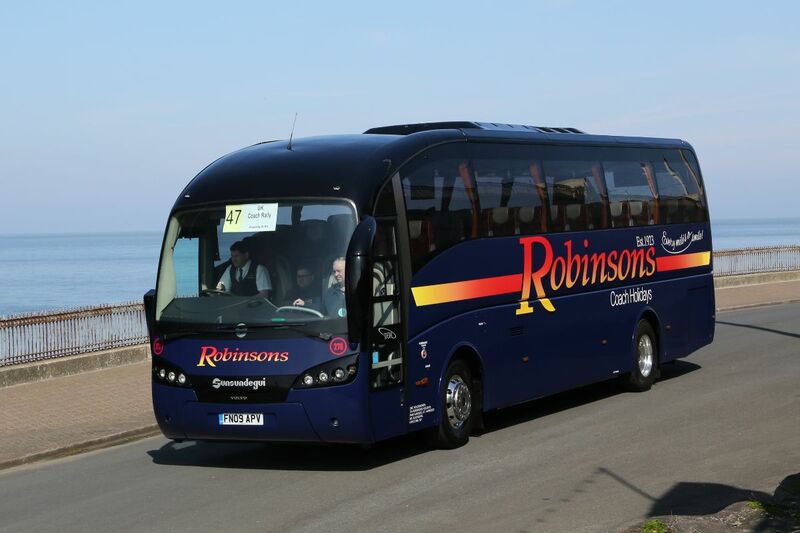 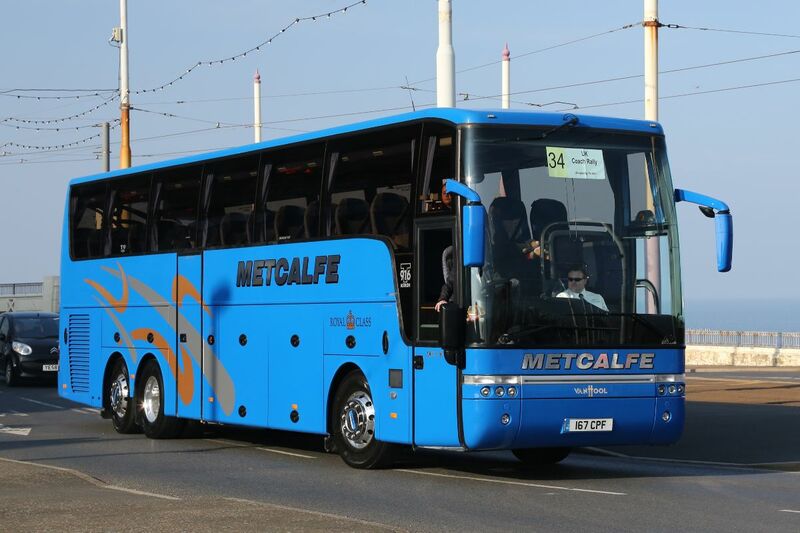 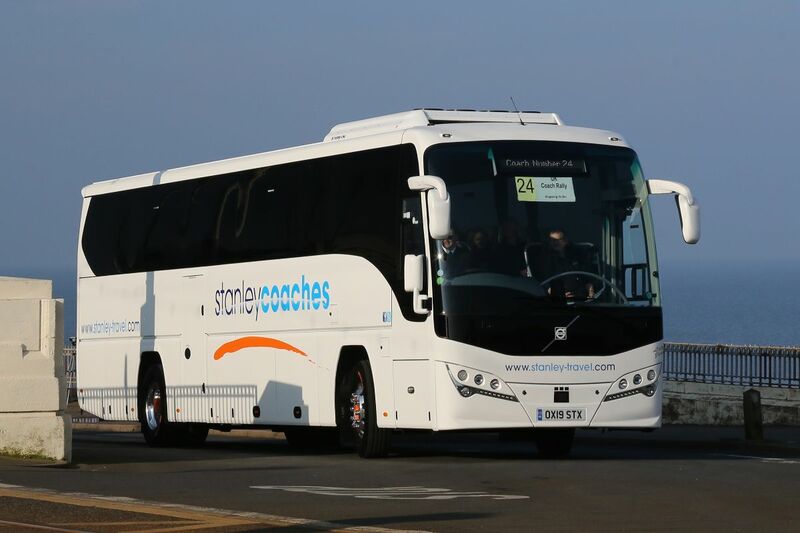 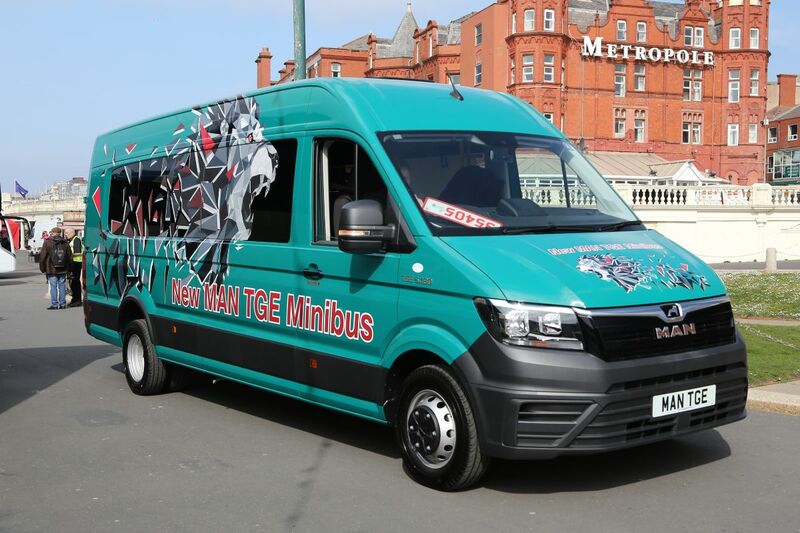 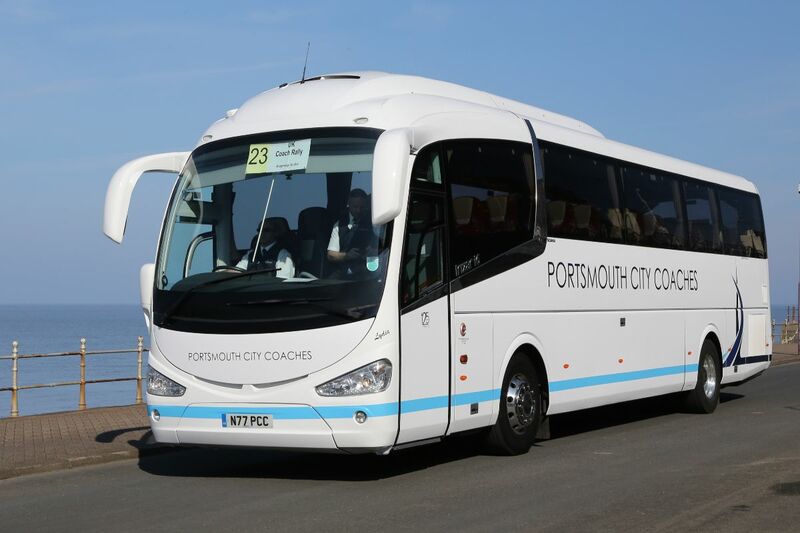 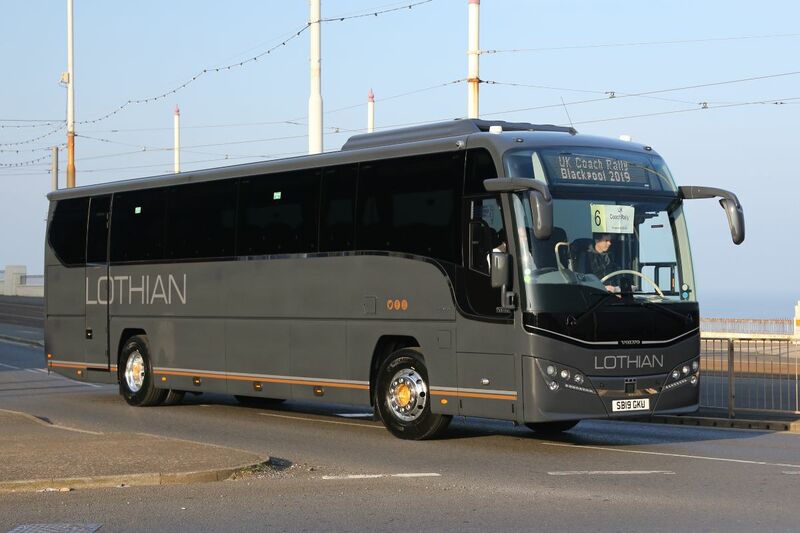 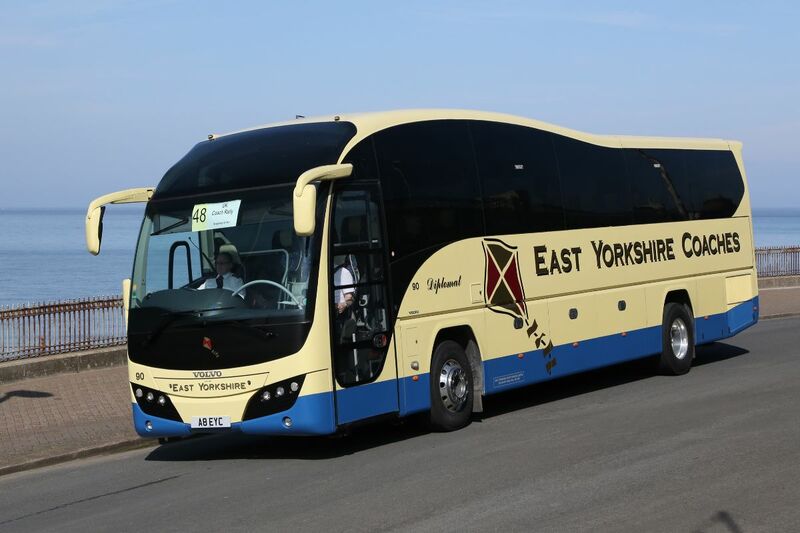 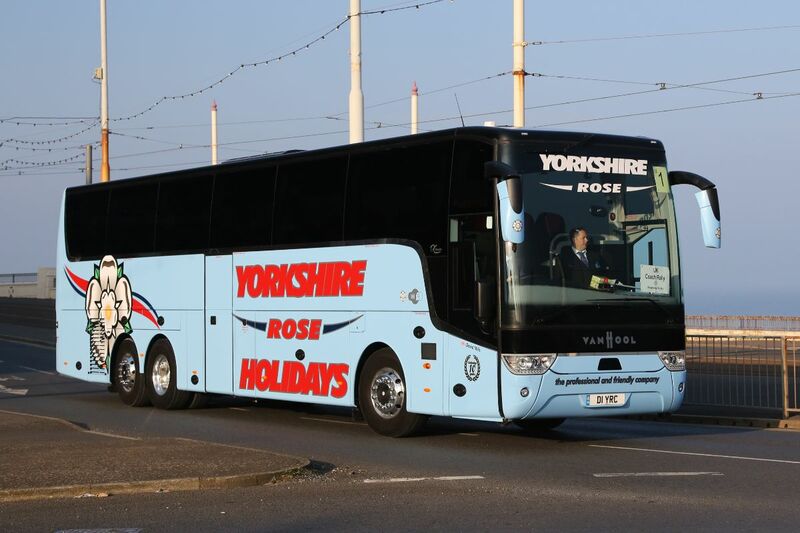 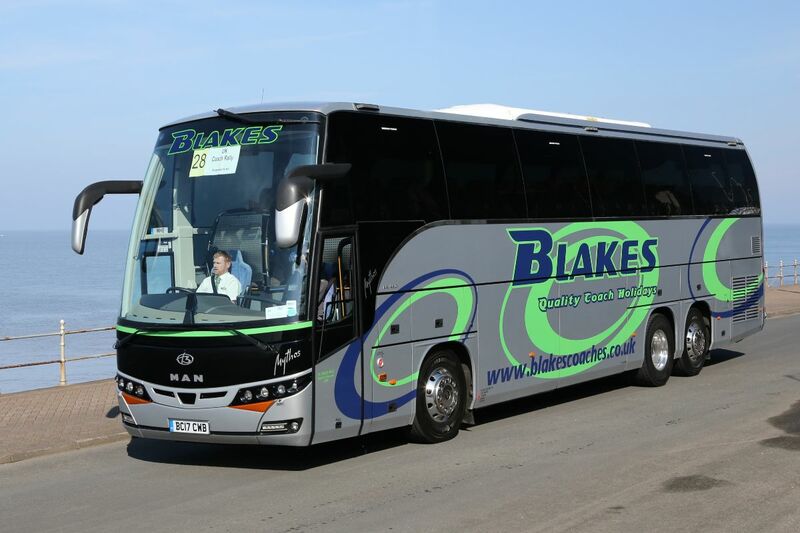 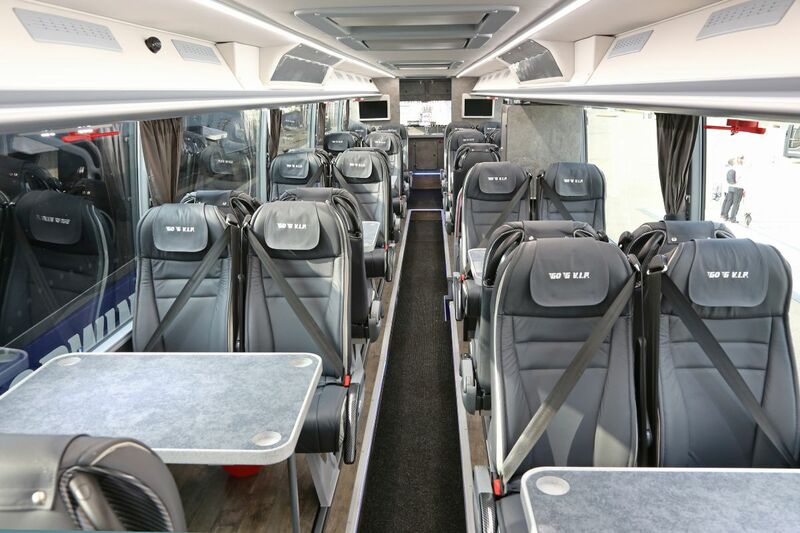 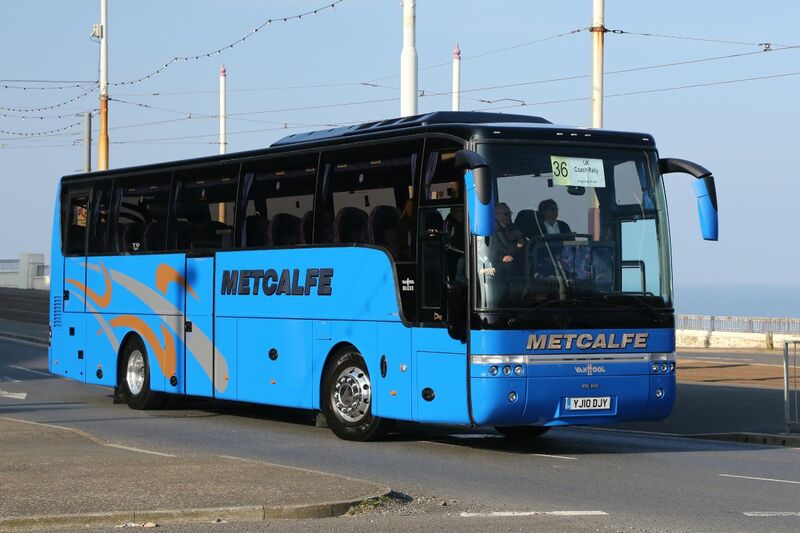 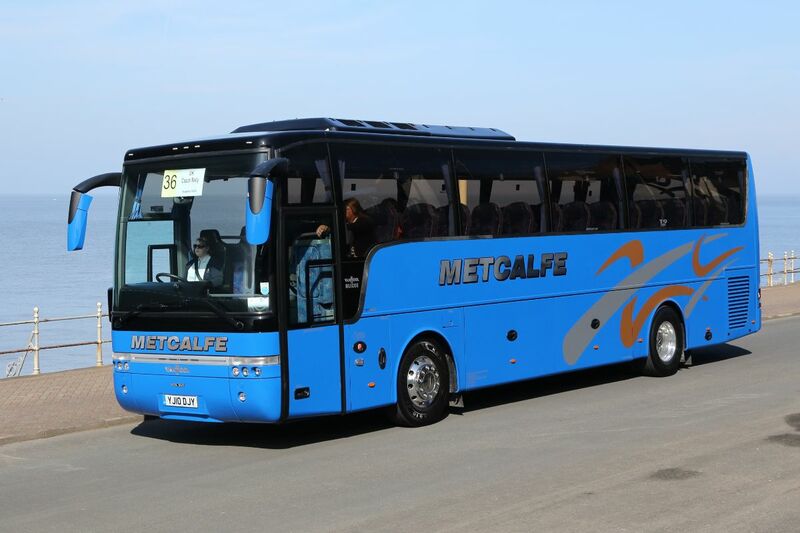 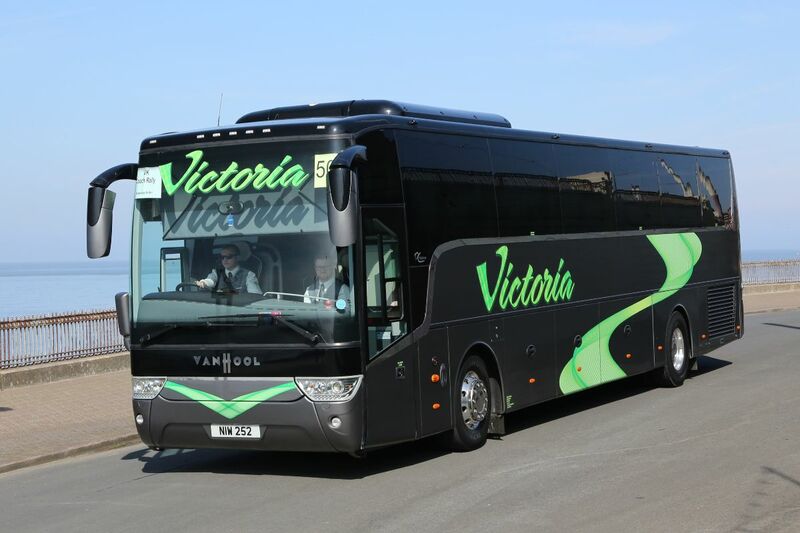 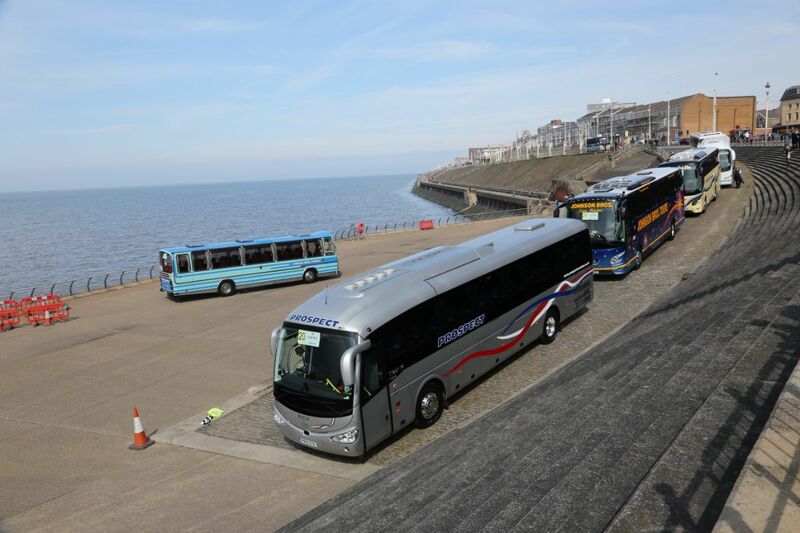 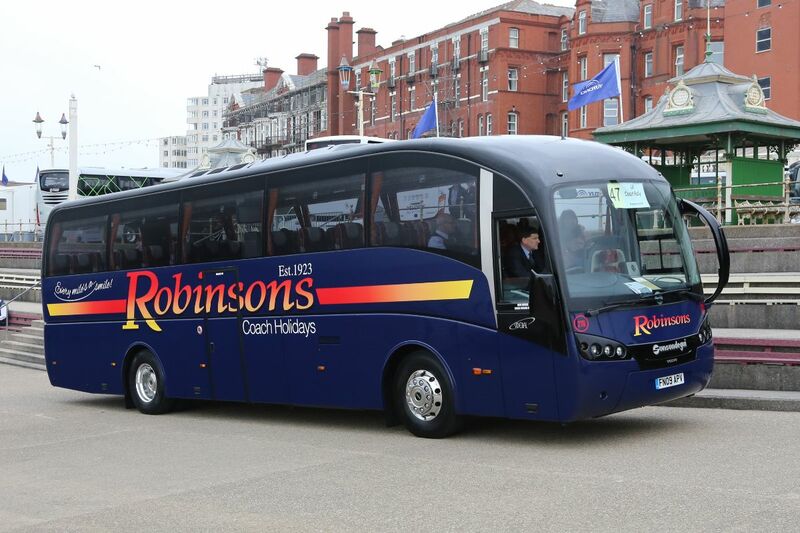 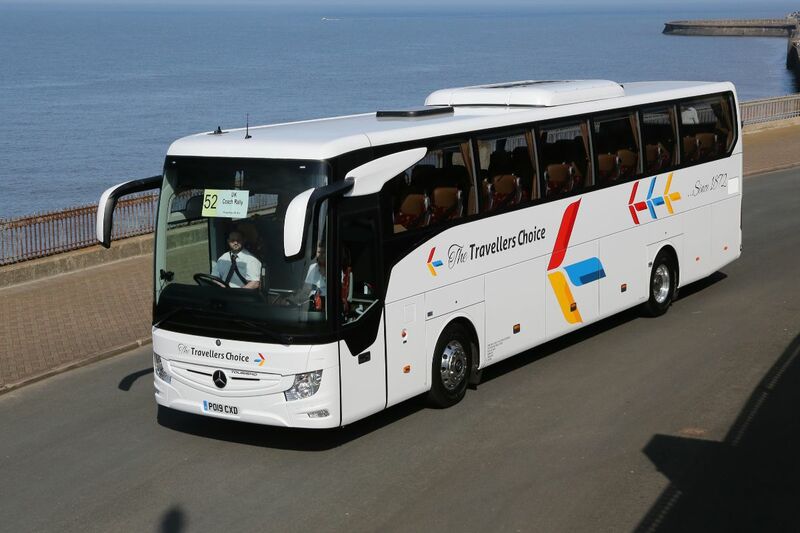 Participating in this for the first time, Go North-East MD Martijn Gilbert drove to success in a B9R Elite from the East Yorkshire Coaches fleet. 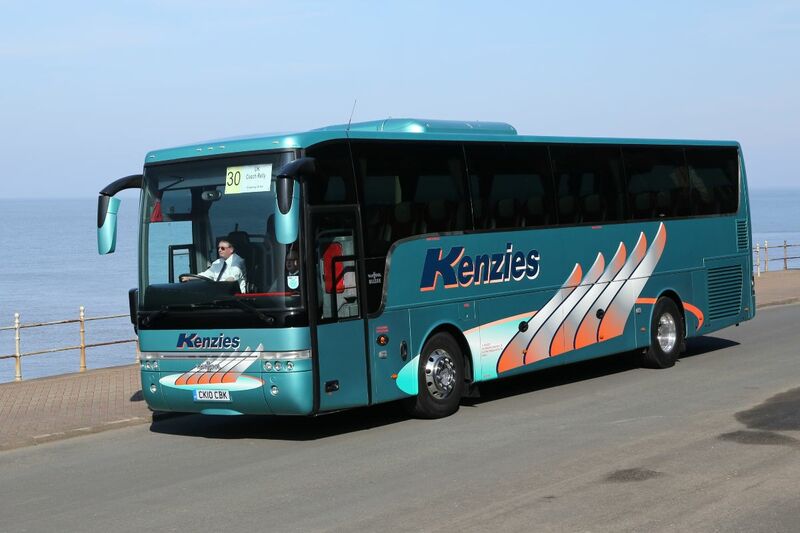 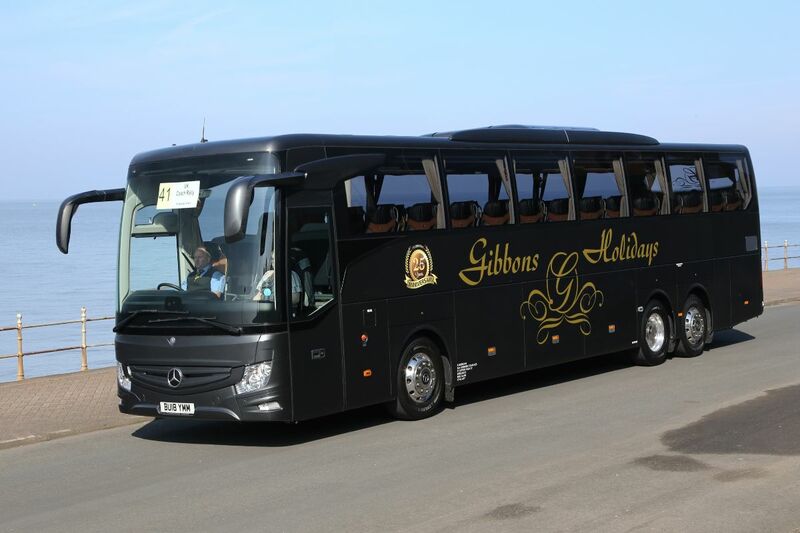 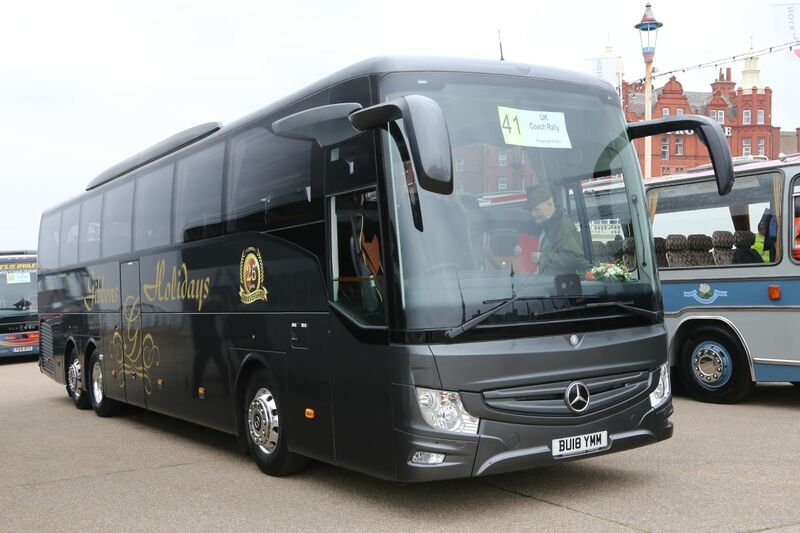 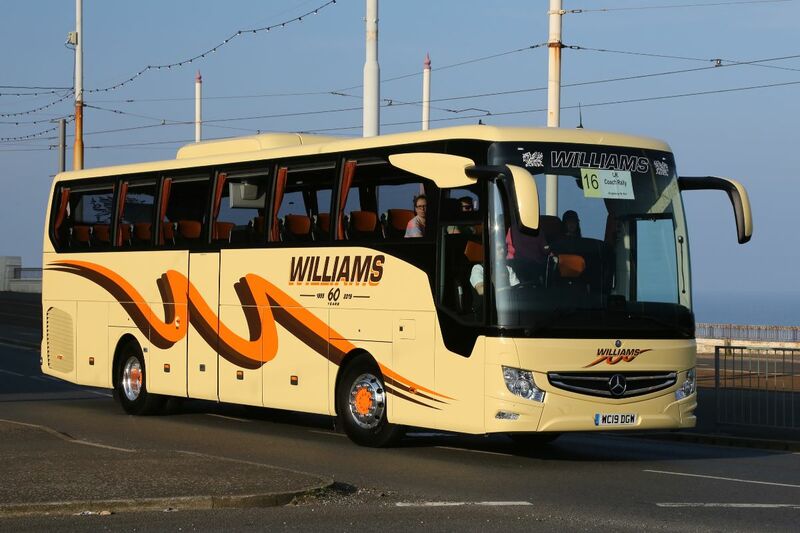 The top coach from Wales was a new Mercedes-Benz Tourismo entered by Williams of Brecon. 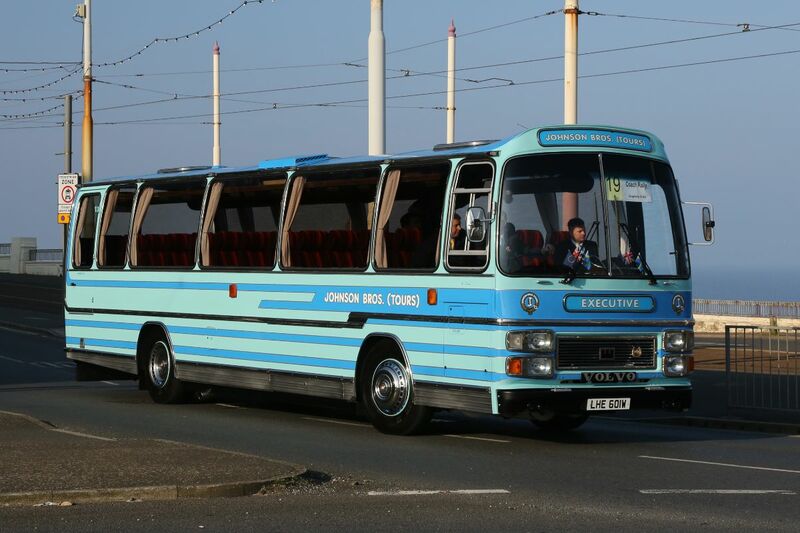 On the bright but cold Saturday morning, the road run took a new route, starting north towards Fleetwood and kept a close secret until the time of departure. 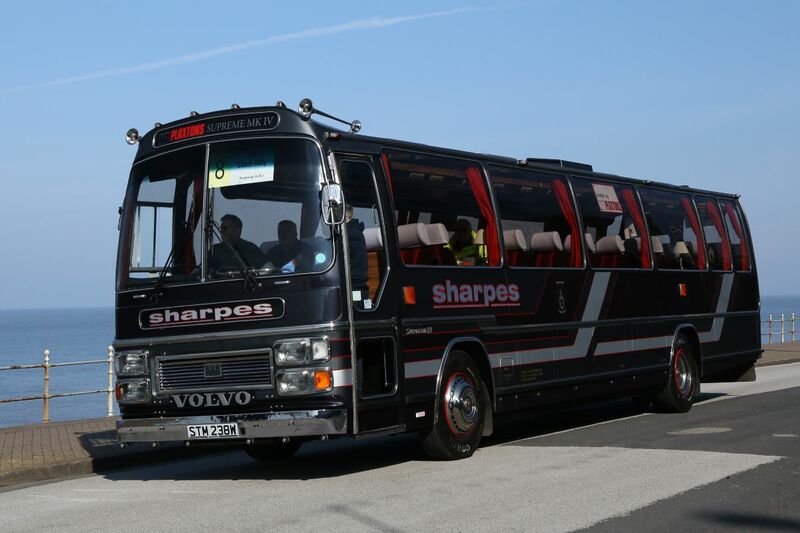 It certainly caught some participating driver/navigator teams out who returned well out of their order of departure. 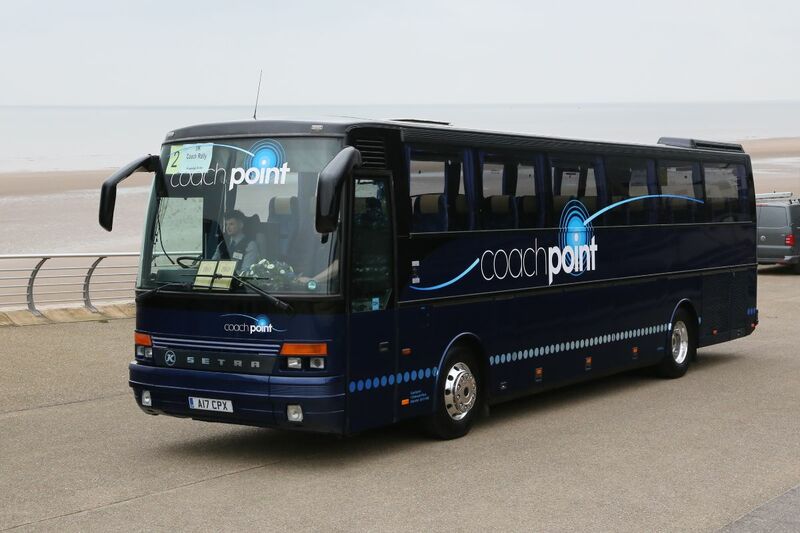 Coachpoint, in a Setra S250 Special, took the award for the top team. 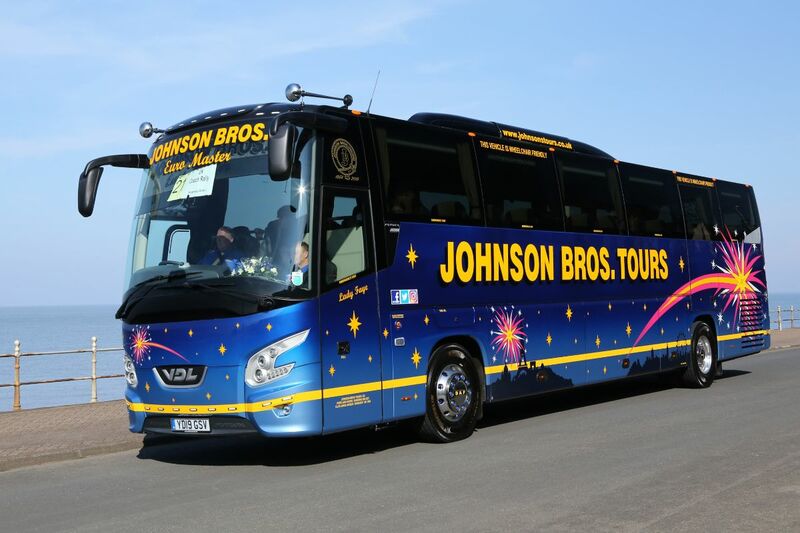 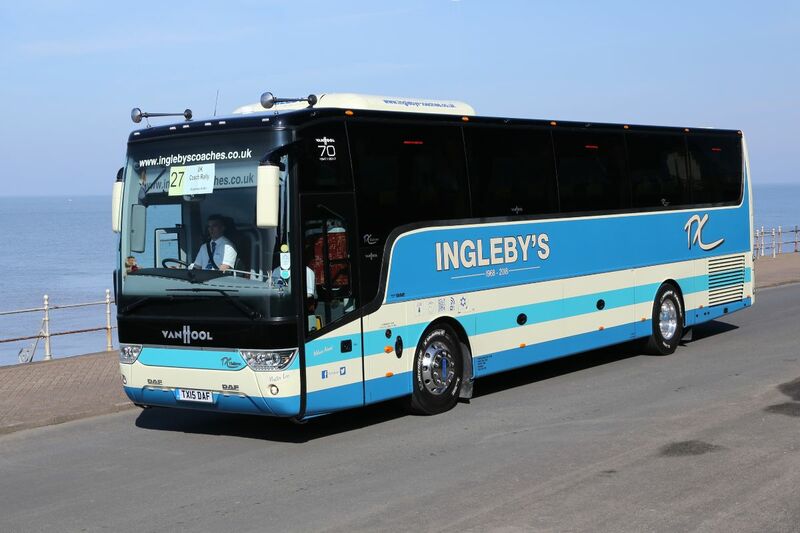 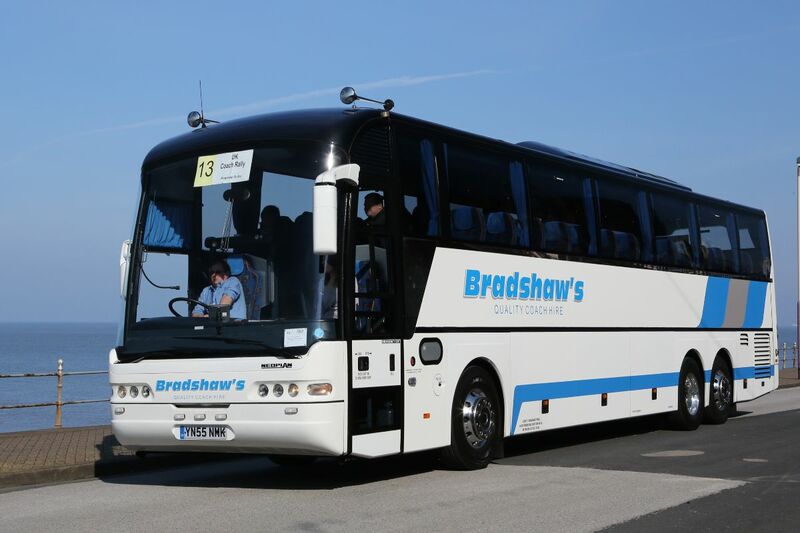 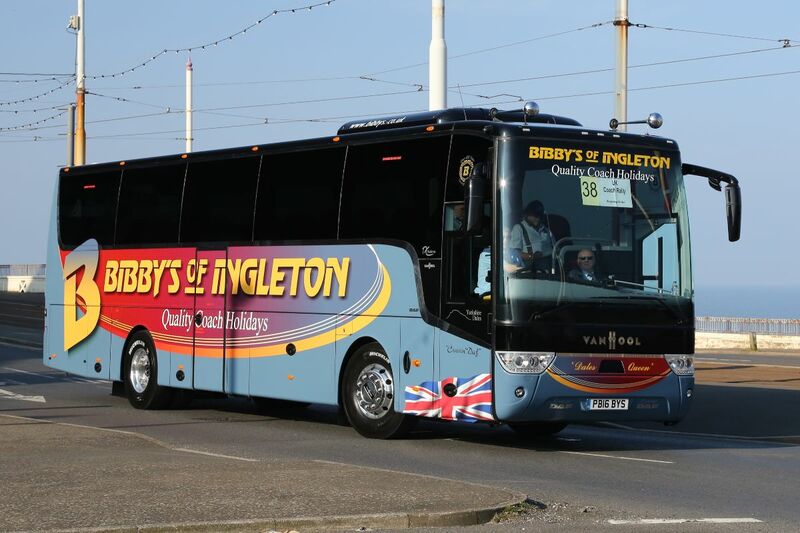 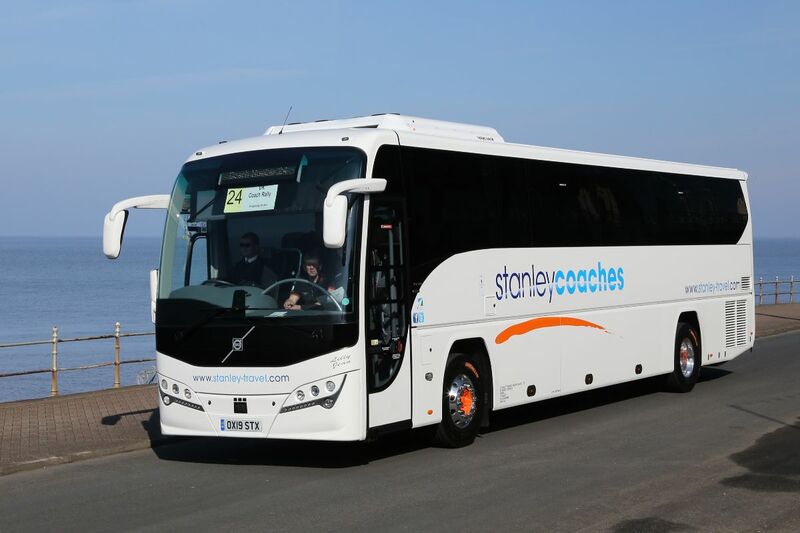 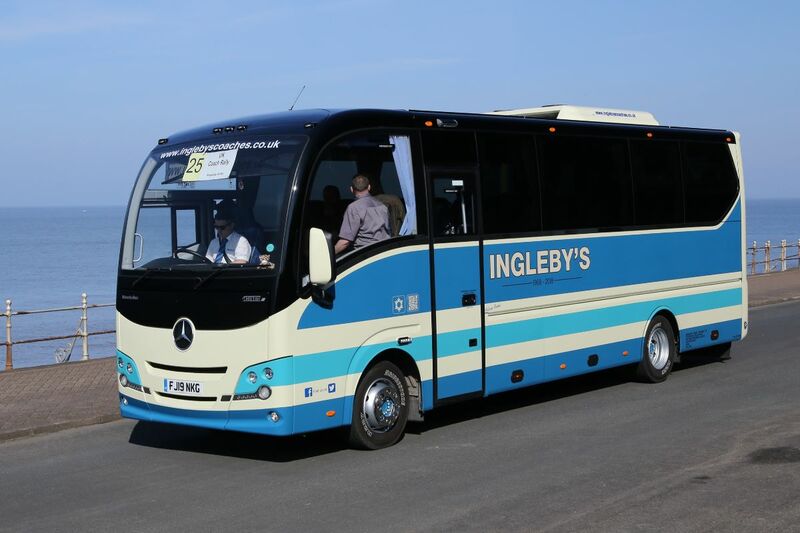 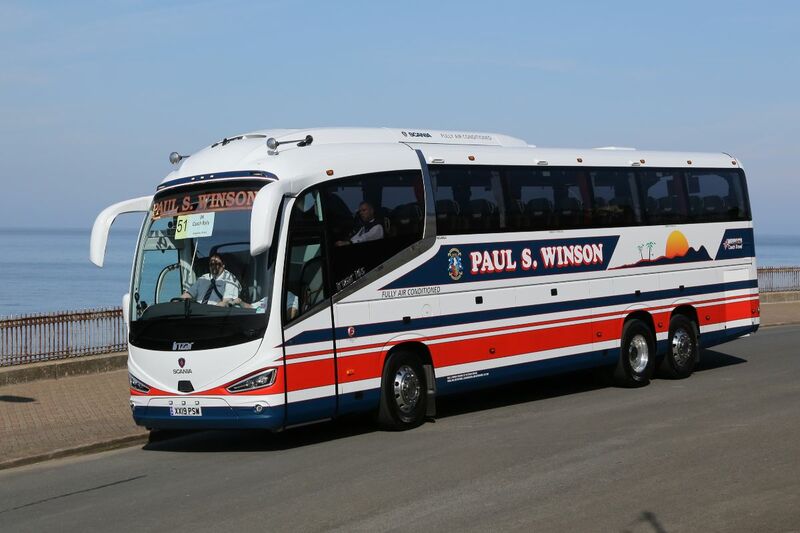 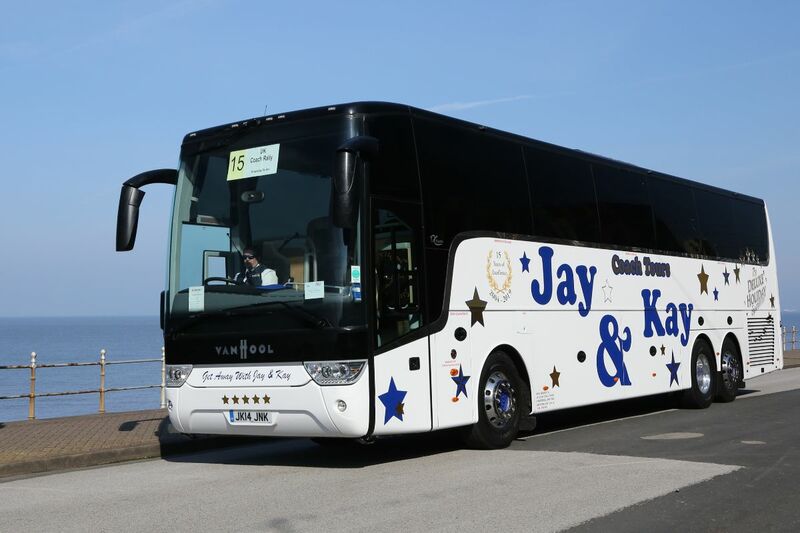 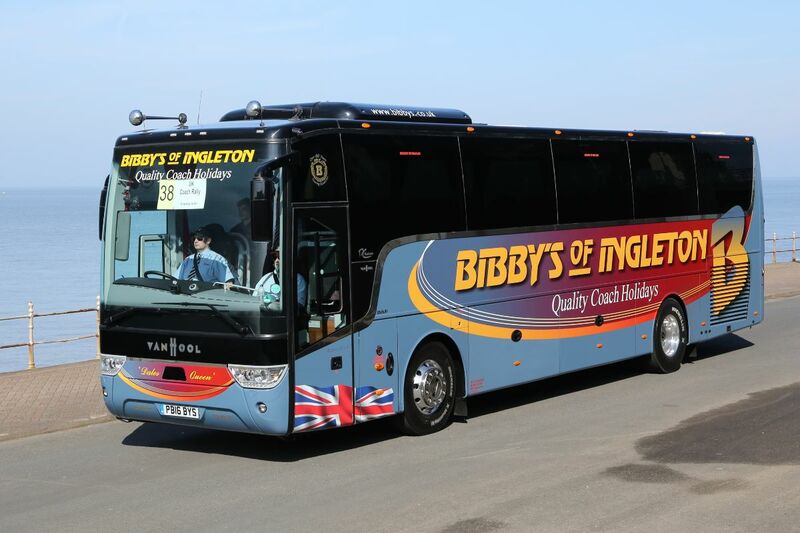 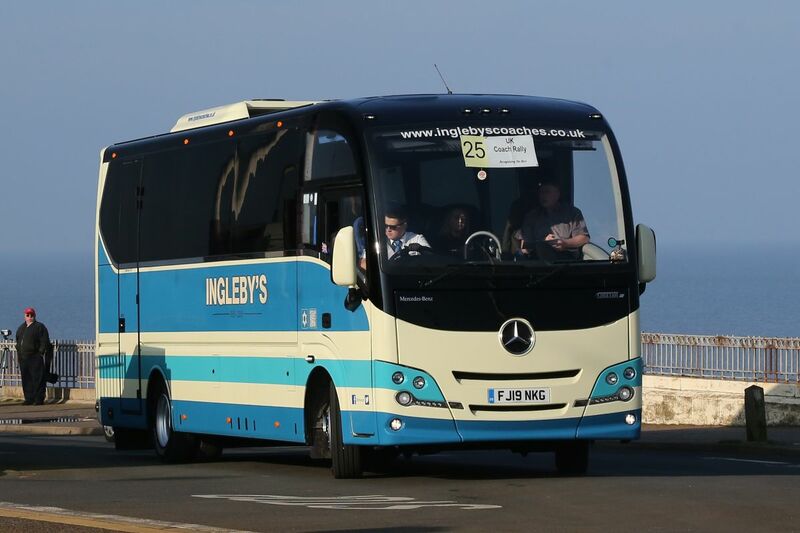 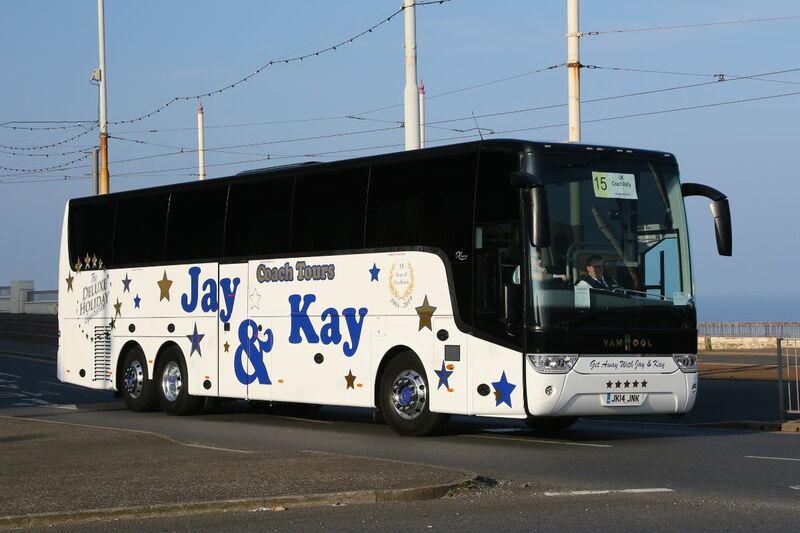 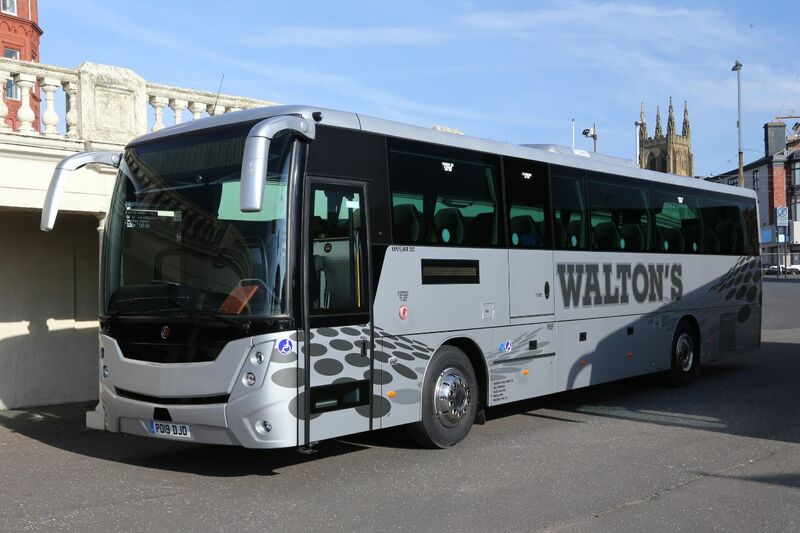 In the subsequent driving skill tests, the leaders’ board became a who’s-who of regular participants with a smattering of new and younger blood, led on Saturday evening by Kevin Walker of Ingleby’s Luxury Coaches in a Van Hool TX15 Alicron. After Sunday’s driving finals, Russell Cooper of Coopers Coaches topped the field and took home the Coach Driver of the Year trophy for the second time. 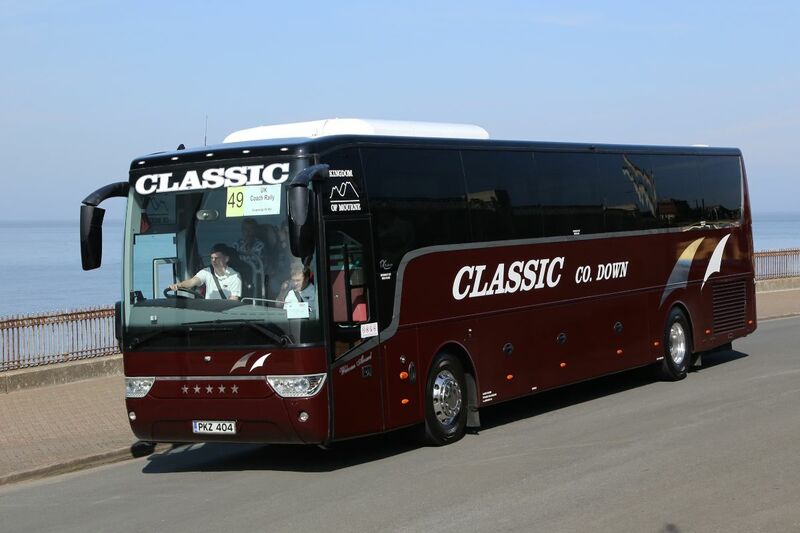 Runner-up on this occasion was Darryn Hughes of Classic Coaches, Co. Down in a Van Hool TX16 Alicron while Adam Mills of Yorkshire Rose Coaches topped the Midicoach class in a Yutong TC9. 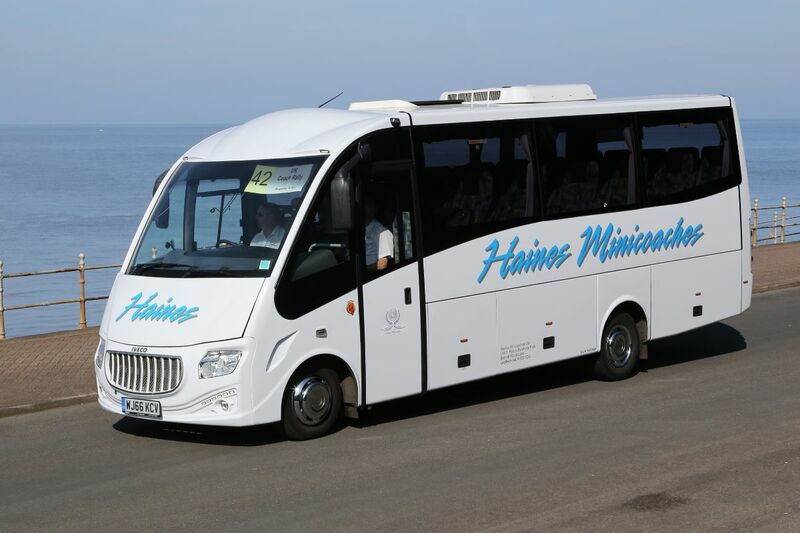 Notably absent from the entrants this year were minibuses, none taking part this year, with the smallest vehicle being Haines Minicoaches’ Sitcar-bodied Iveco 70c17. 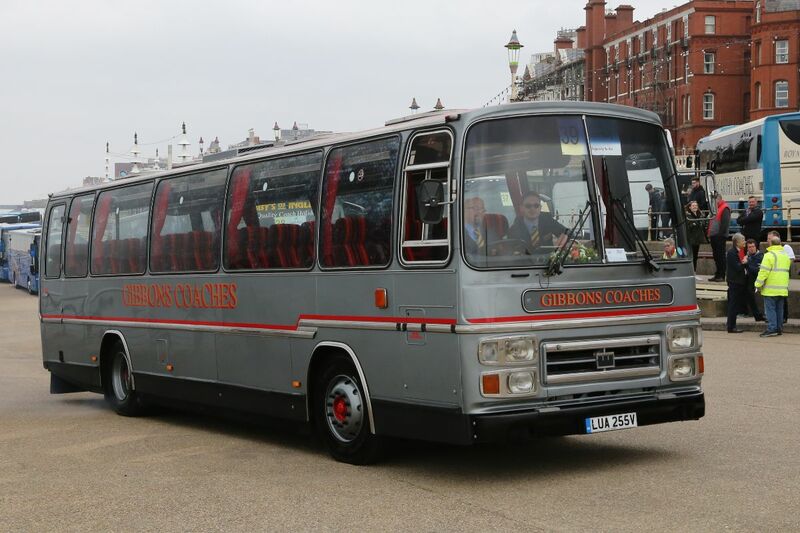 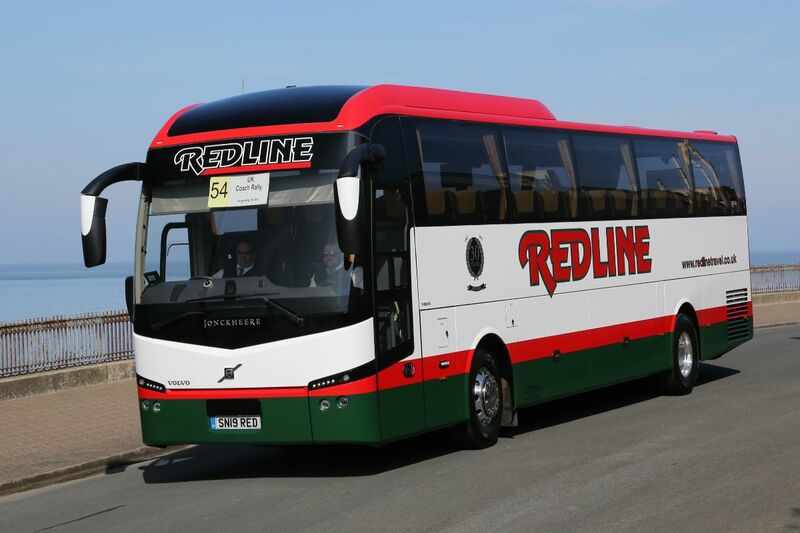 Six of 2019’s entries were heritage vehicles, no fewer than four of them having Plaxton Supreme coachwork. 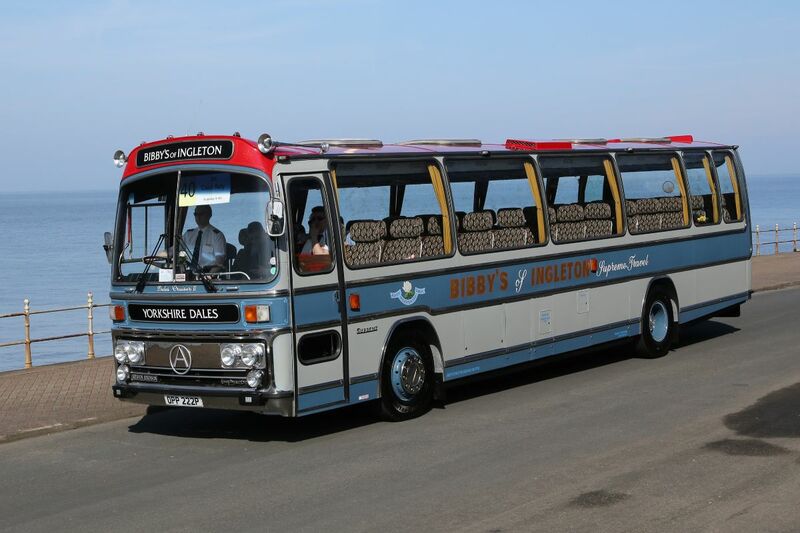 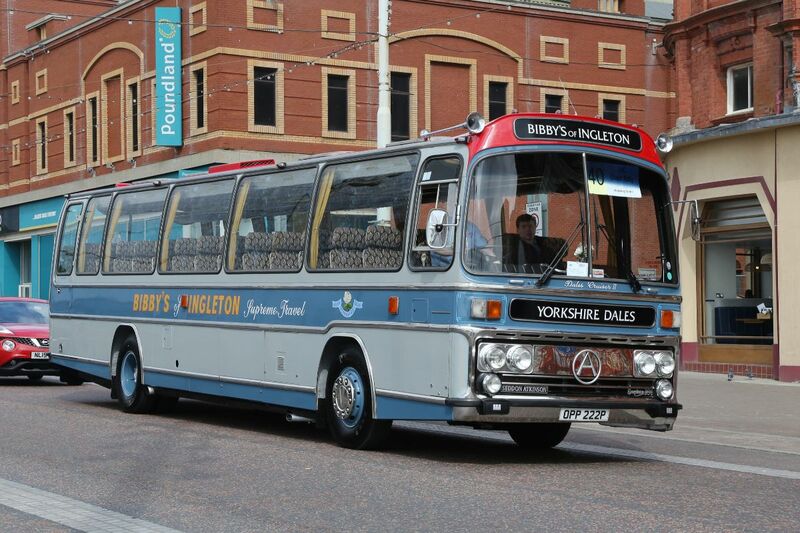 One of these was based on the now rare Seddon Pennine 7 chassis with Gardner engine entered by Bibbys Coaches of Ingleton, the others being Volvo B58 based from Gibbons Coaches, Johnsons Brothers and Sharpes of Nottingham, the latter taking the Rita Dalziell Trophy for the top coach aged 25 years or more. 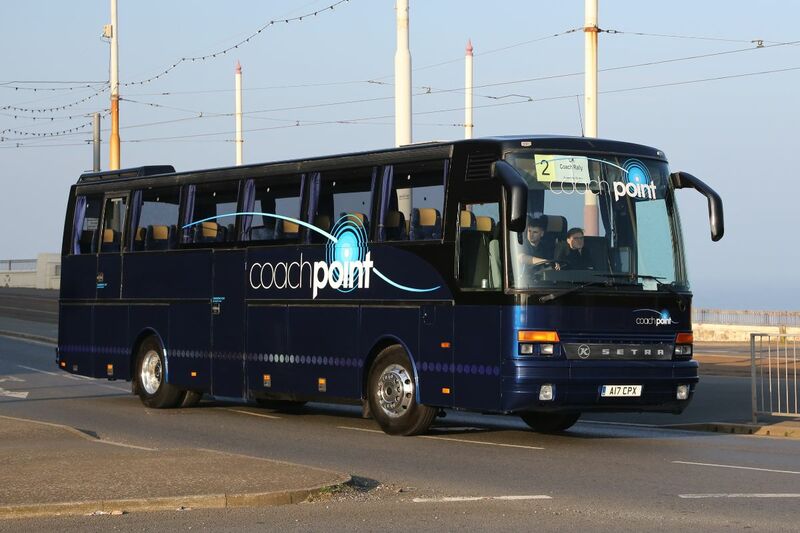 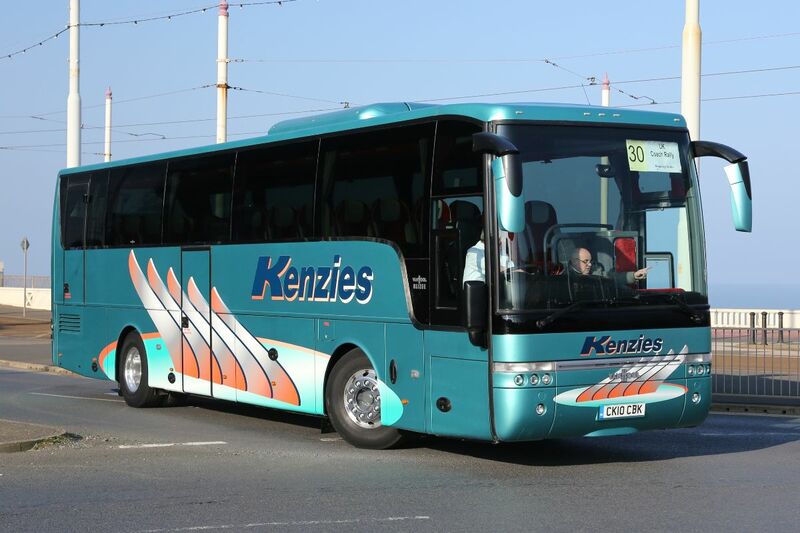 Richard Webb’s Mercedes-Benz 0303 and Coachpoint’s Setra completed the category. 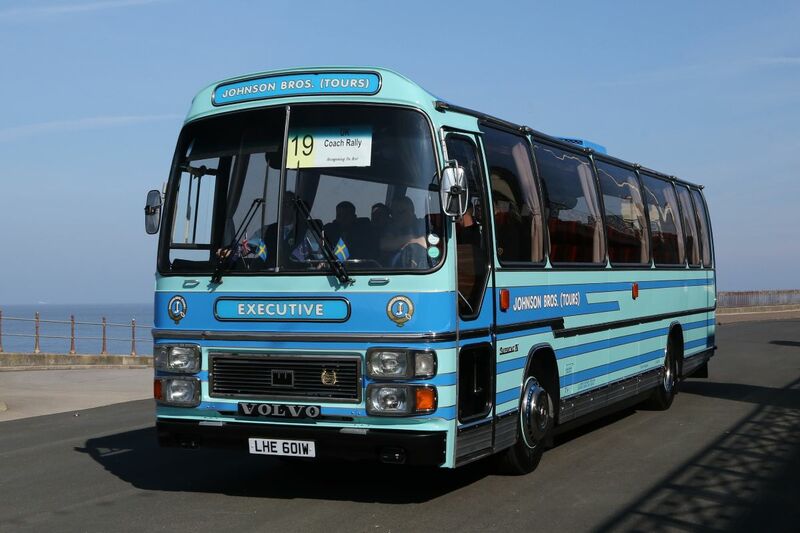 Away from the Promenade, while the Bus and Coach Buyer team was busy compiling this report, many entrants and guests reported that they enjoyed a good Saturday night of entertainment at the Imperial Hotel. 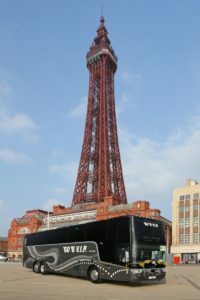 Although some stalwarts were missing, there was nonetheless a good selection of trade support present on Blackpool’s seafront, with recently announced models from several manufacturers. 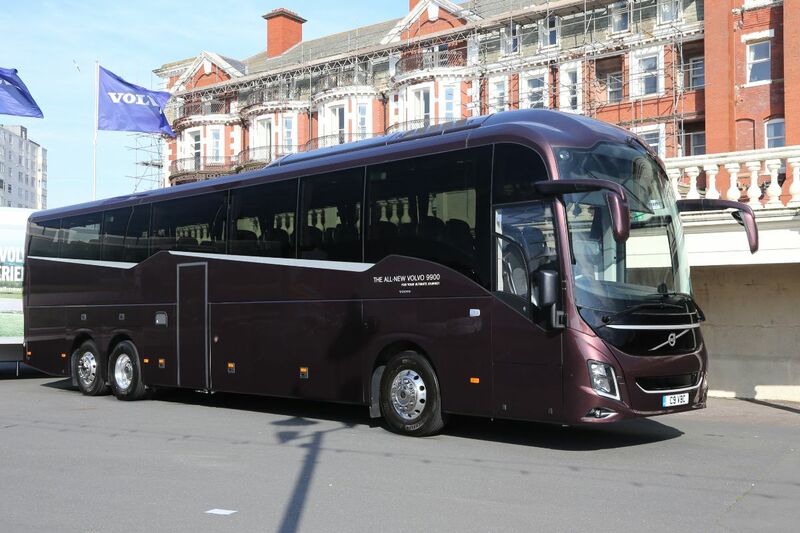 Plaxton took the event very seriously with a hospitality unit and a line up of three coaches, all on Volvo B8R 4×2 chassis. 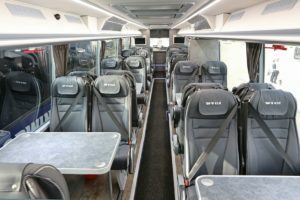 Corporate Coaching is the first customer to take the Elite body on B8R and one of its batch of 13.135m coaches appeared with 53 seats. 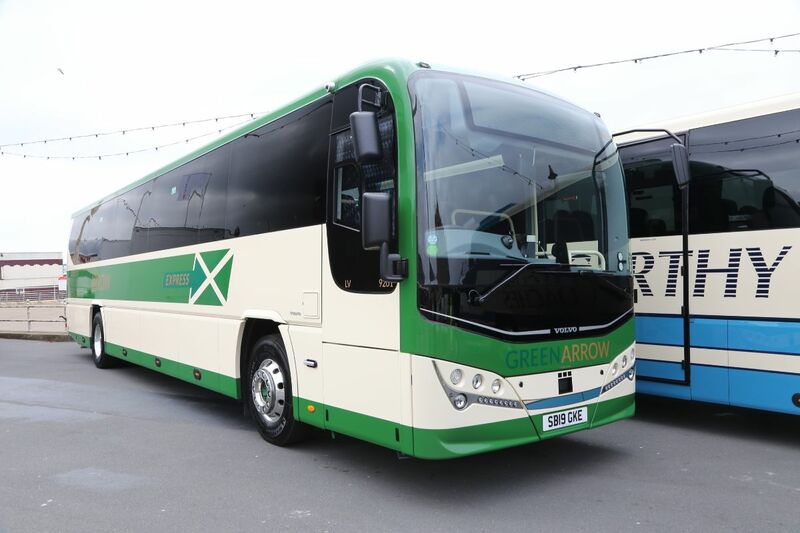 The Leopard Interurban covered in the News section in this issue appeared in Lothian’s Green Arrow colours. 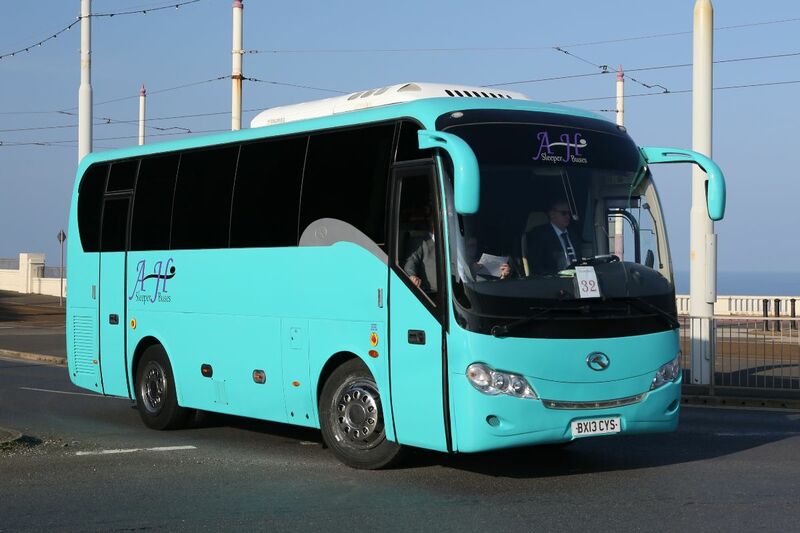 Finally, there was another of the growing number of Leopard options, a 12.2m coach with 57 seats and a mid-mounted emergency door. 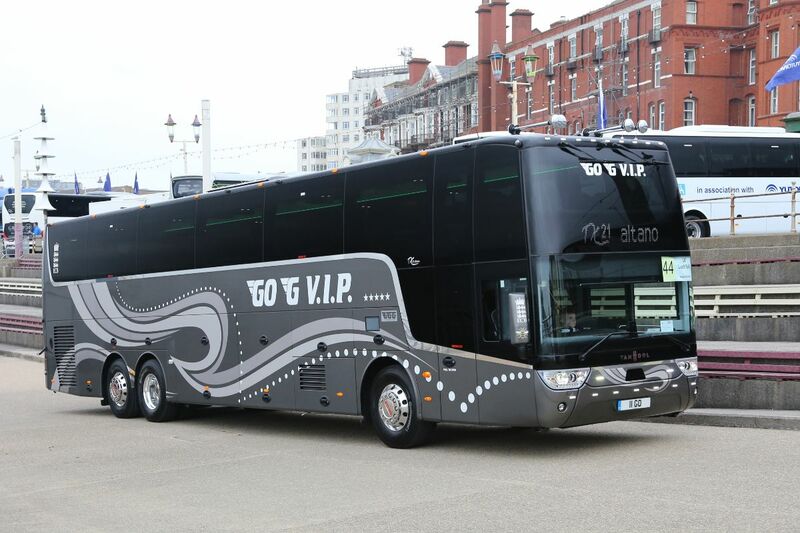 MAN’s two exhibits were very different beasts. 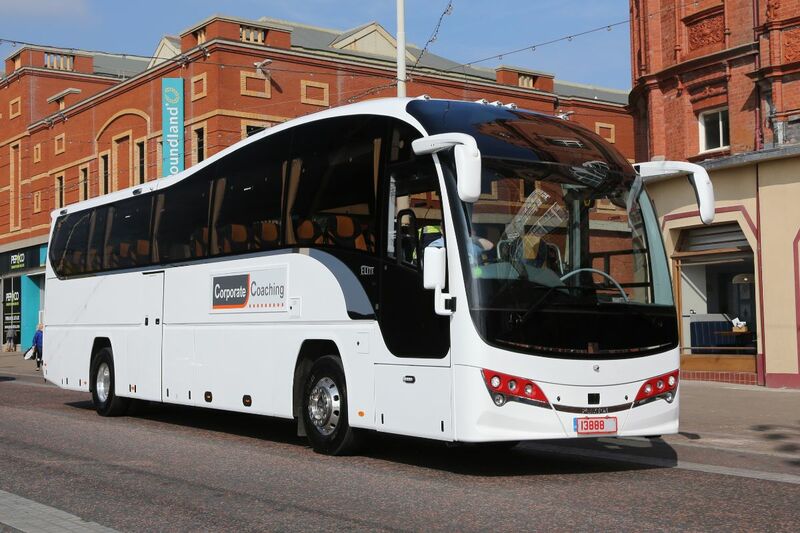 One was the fourth new model Tourliner in the last year for Group 10 of Newcastle. 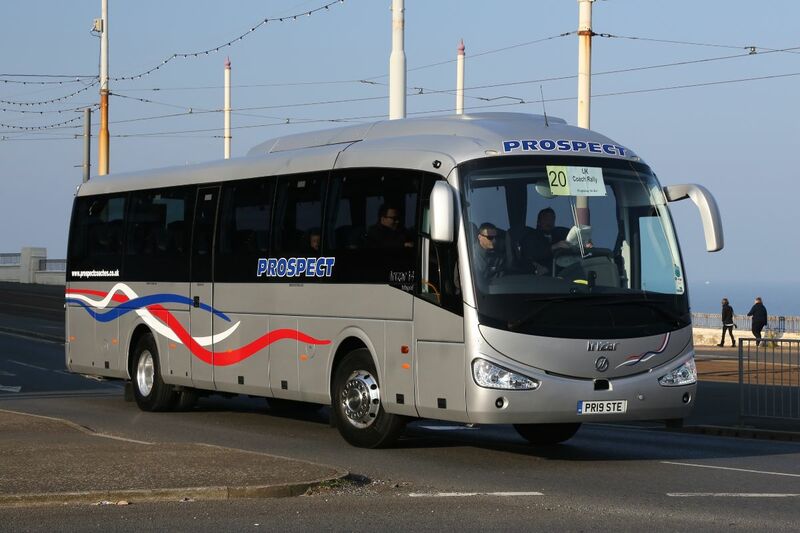 This 49-seat P21 variant featured the 460hp engine and the latest TipMatic transmission based on the ZF TraXon automated transmission. 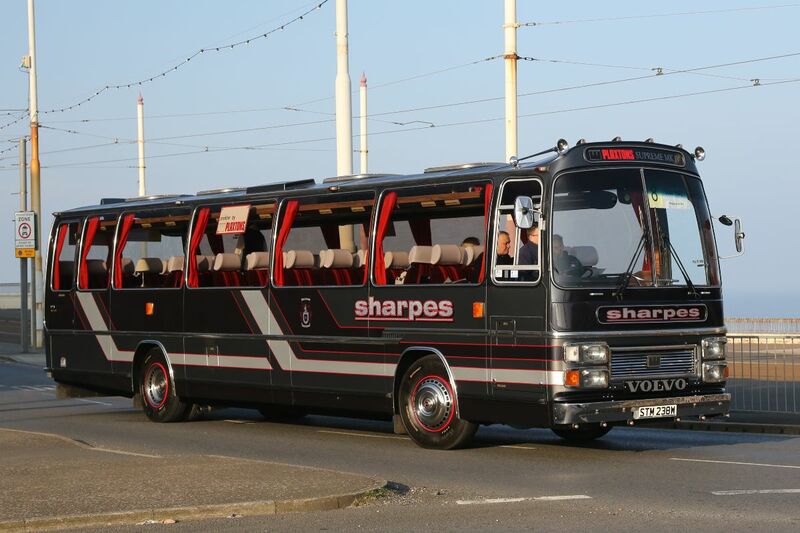 Far smaller was a TGE5.180 extra-long, high-roof, van-based conversion by Minibus Options seating 17 (including driver) and equipped with a rear AutoAdapt lift. 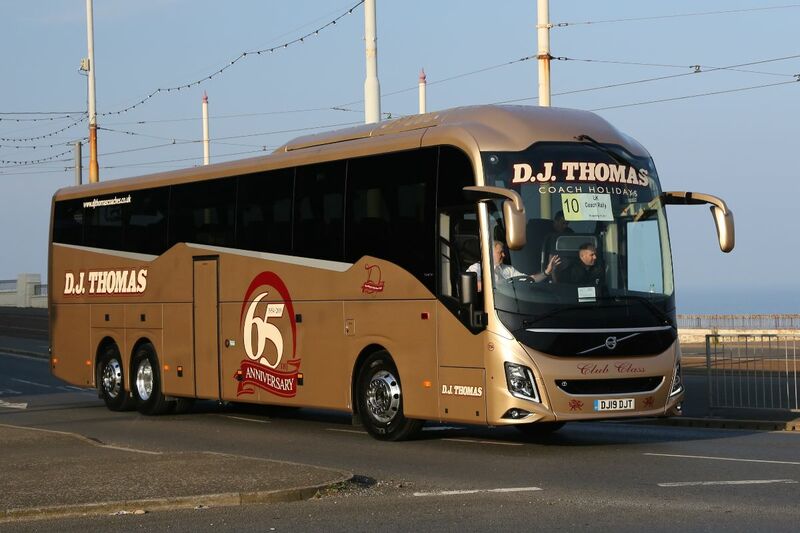 The TGE5 is rated at 5 tonnes GVW but there is also a 5.5 tonne TGE6 as well as smaller options down to 3.5 tonnes. 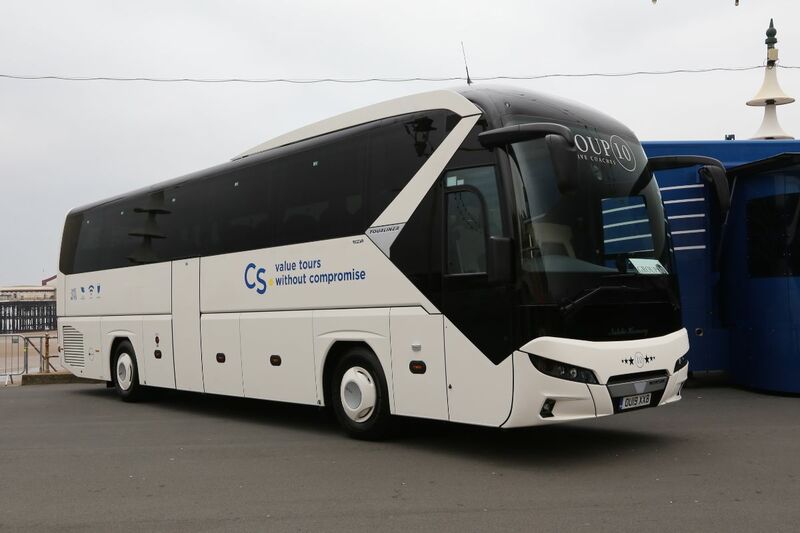 Larger units can have six-speed manual or seven-speed ZF automatic transmissions. 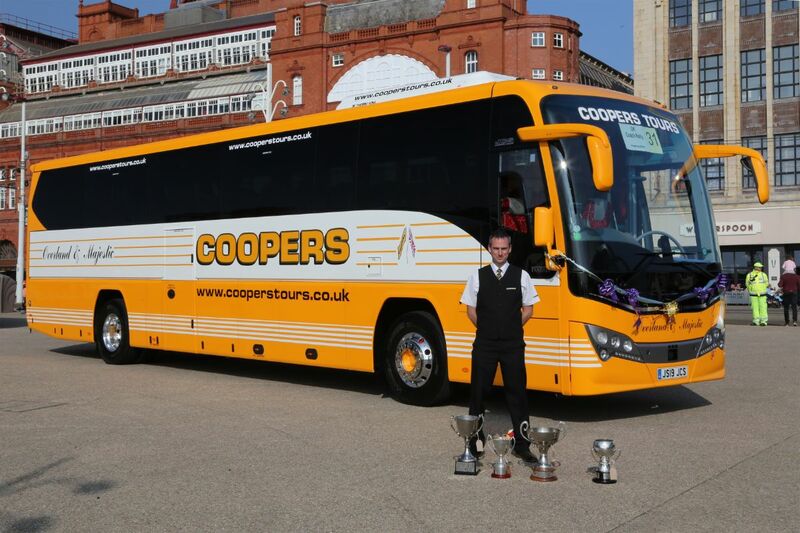 MAN also took along a hospitality unit. 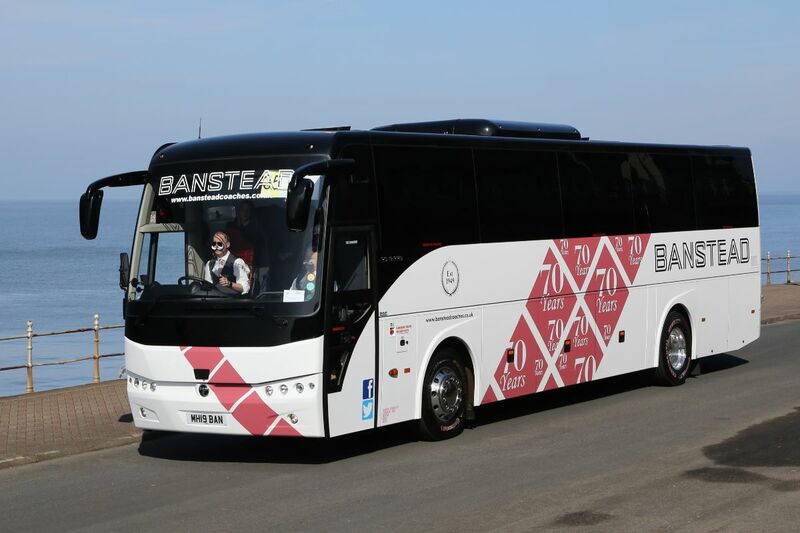 Accompanying a mobile hospitality unit that had travelled from Sweden to be present, Volvo were represented by the 13.1m 9900 tri-axle with 460hp D11K engine and the new B11R mounted coach from MCV with the 430hp version of the same unit. 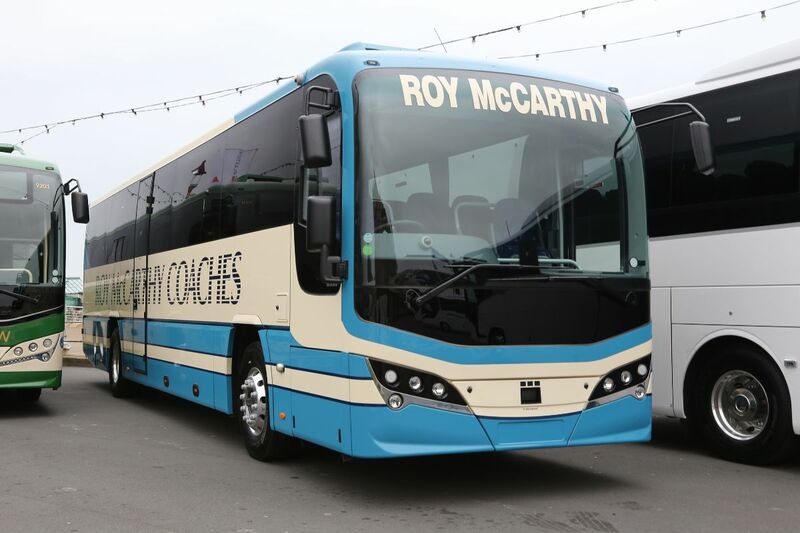 The distinctive 9900 comes with 53/55 recliners and an extensive specification list. 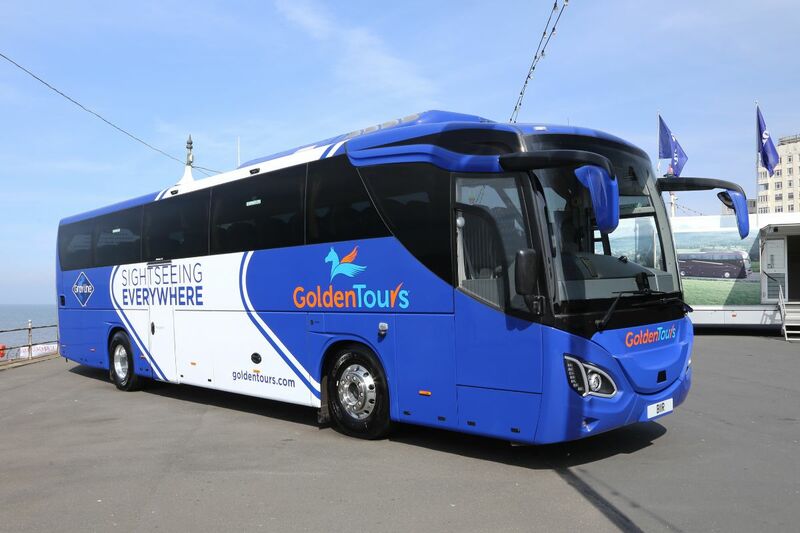 In the colours of lead customer, Golden Tours, the 12.6m stainless steel bodied MCV was equipped with 53/55 Brusa recliners, Sutrak air conditioning and a 9.0 cubic metre luggage hold. 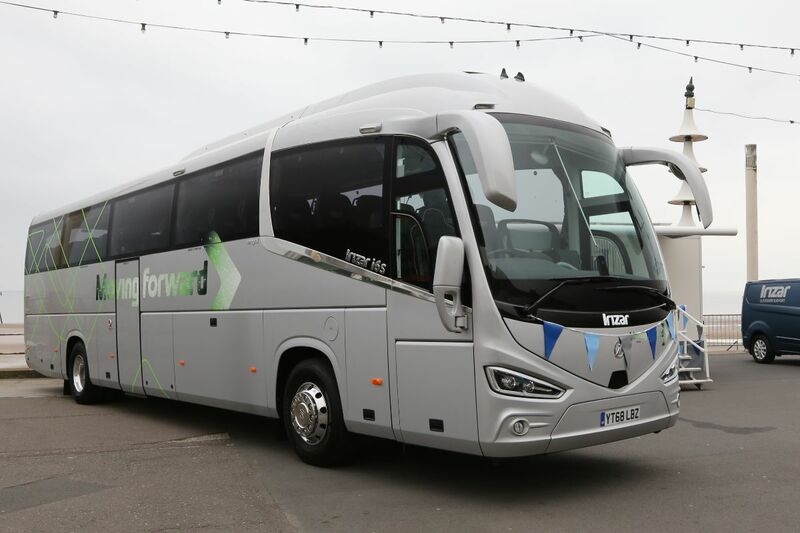 Irizar took along a hospitality unit, a service van and a 12.9m i6S demonstrator with 408hp Paccar/DAF MX11 engine and the (now standard) ZF TraXon automated transmission. 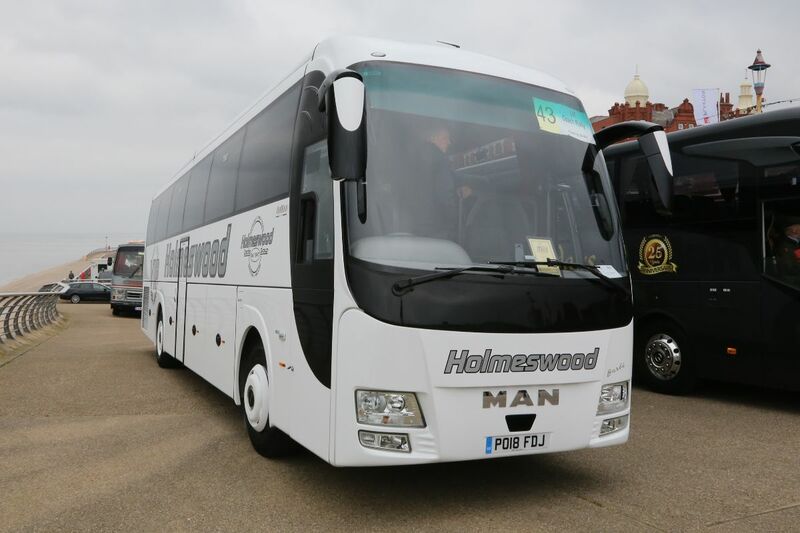 Features included the new digital dashboard as well as a number of fuel saving developments including body height lowering, a gearbox coasting mode and some on-demand components. 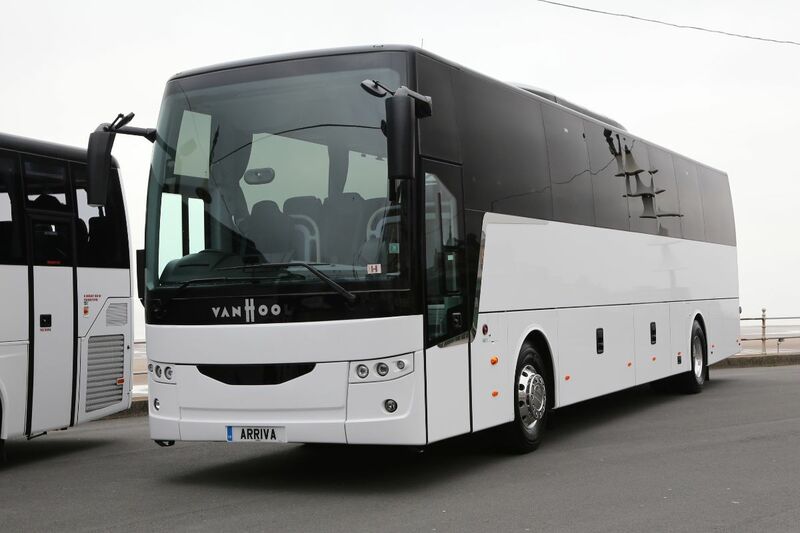 Read about this technology in the road test in this issue. 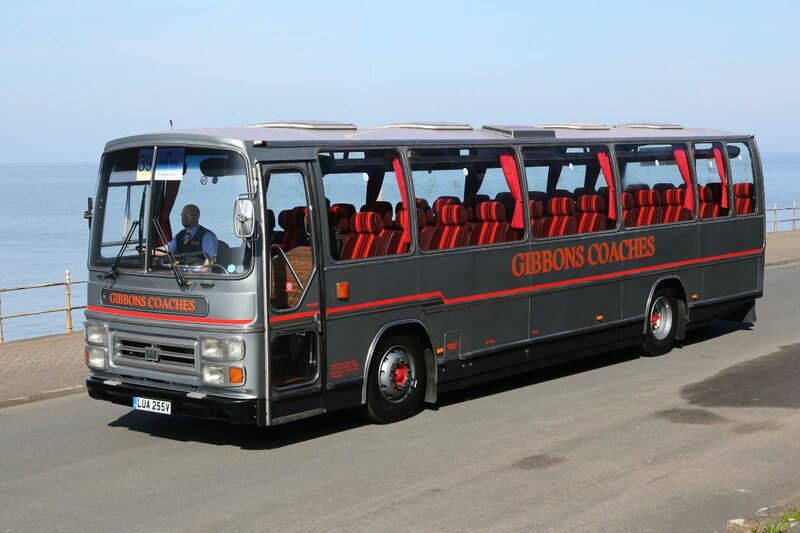 It had 53 seats and a toilet and the coach shown retails at £255,000. 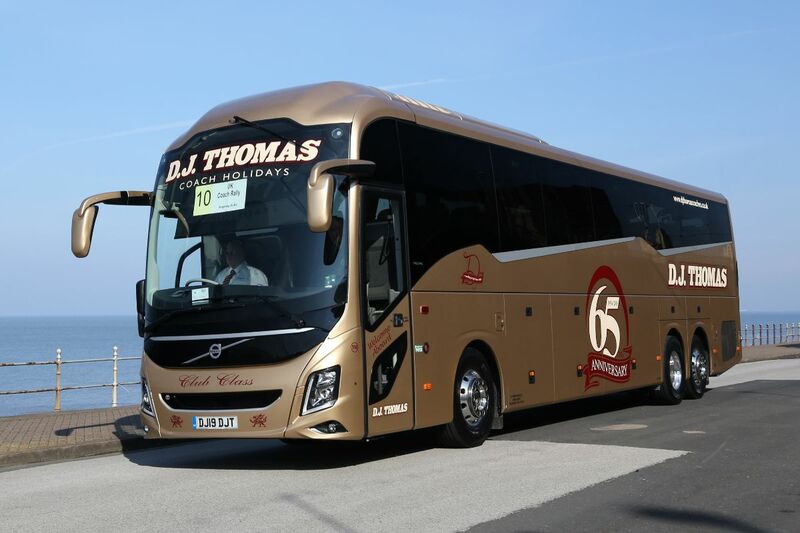 Deliveries and orders on hand for this year already amount to 60 units which is more than at this stage last year. 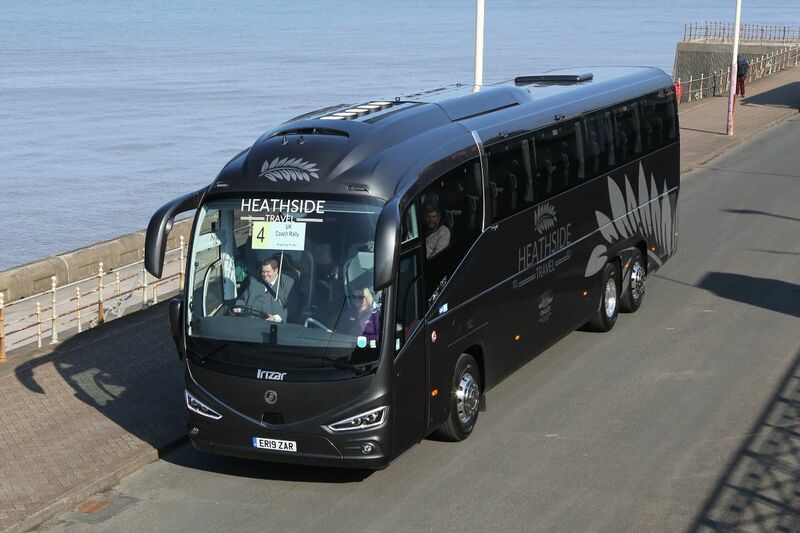 I was also told that Irizar’s 67-plate, 12.9m hybrid driveline, i4 demonstration coach which has a 6.7-litre Cummins engine and Eaton hybrid equipment will shortly be available at £195,000. 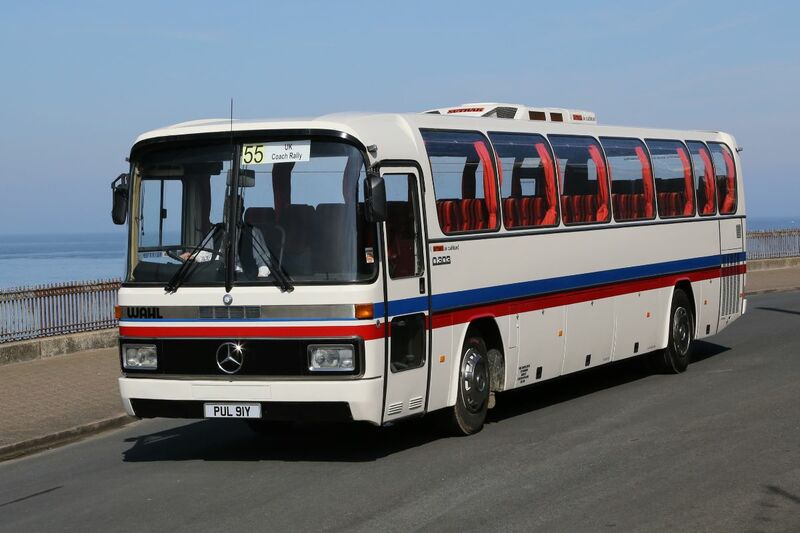 It has 57 seats and a lift. 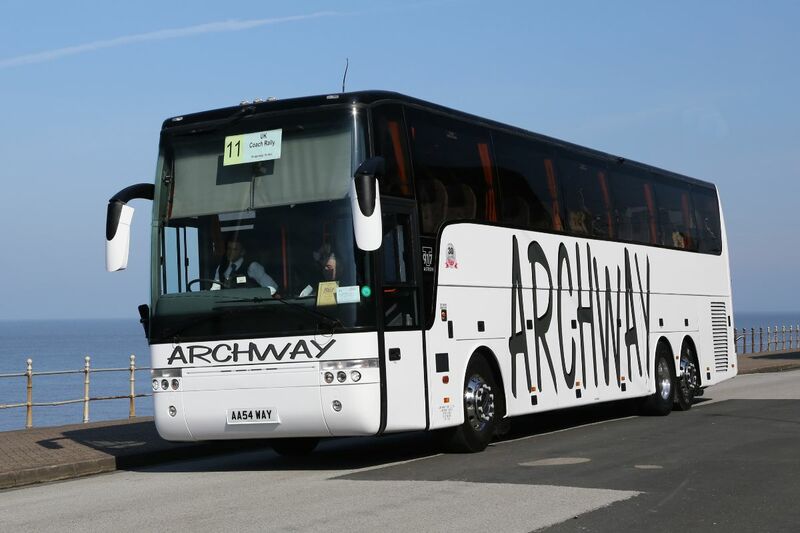 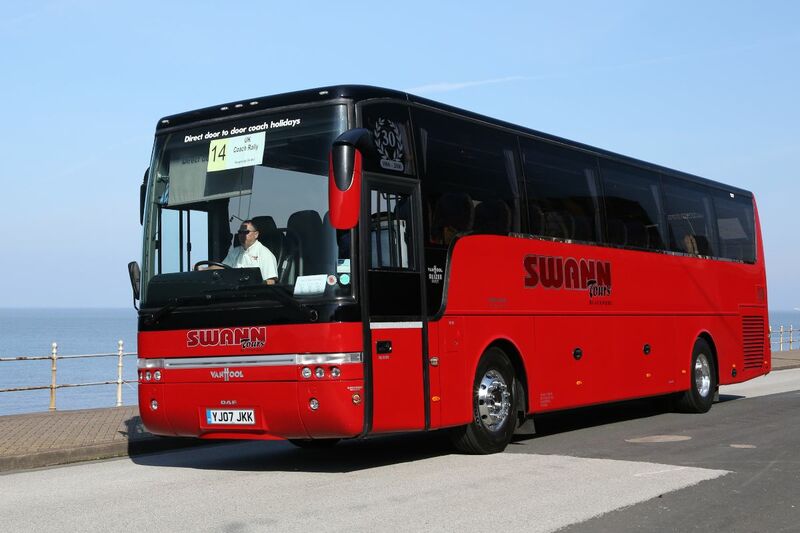 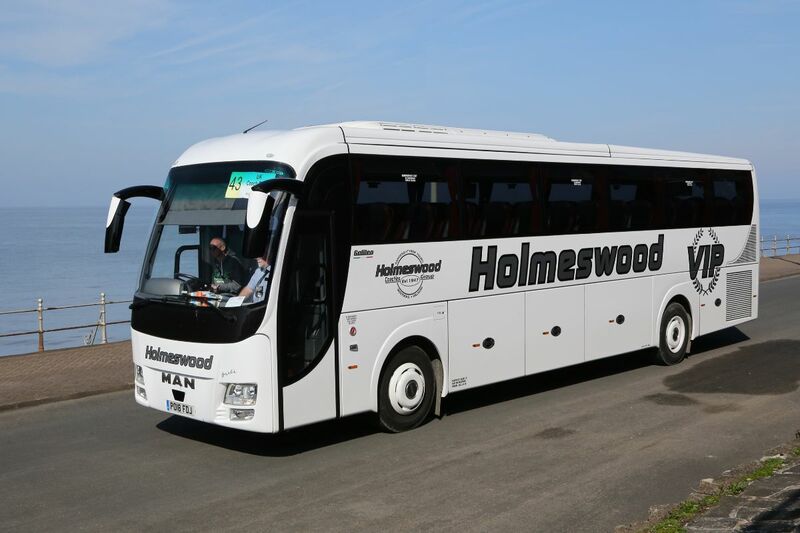 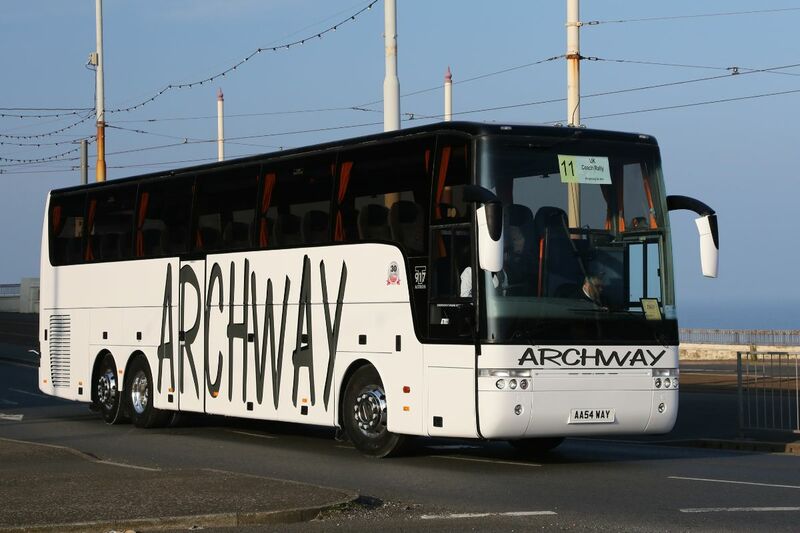 Arriva Bus & Coach were pleased to have made a Van Hool EX15H sale on the first morning of the weekend. 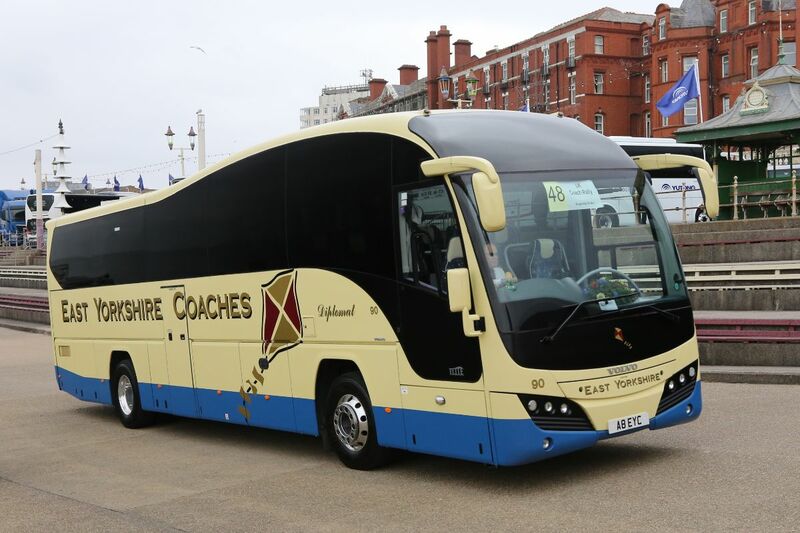 The dealership’s display was centred on the Temsa MD9 midicoach and the Van Hool EX16M. 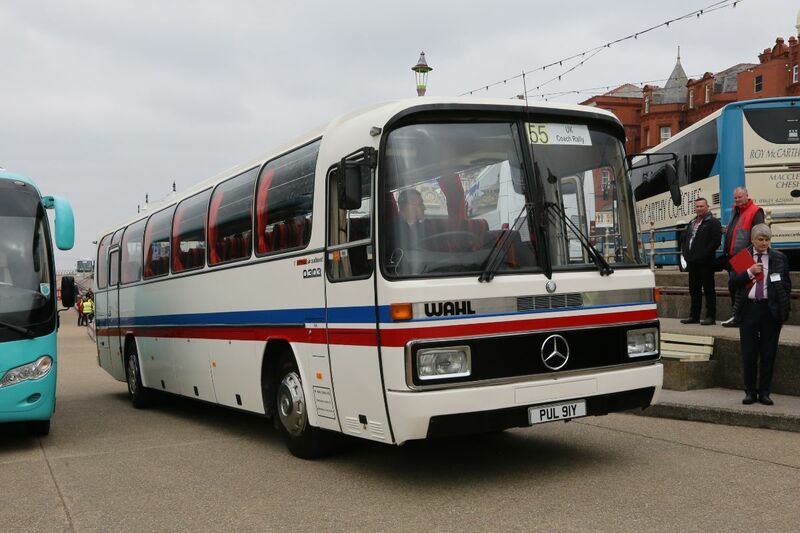 The former was a straight 39 seater though a 34 seat version with toilet is an alternative. 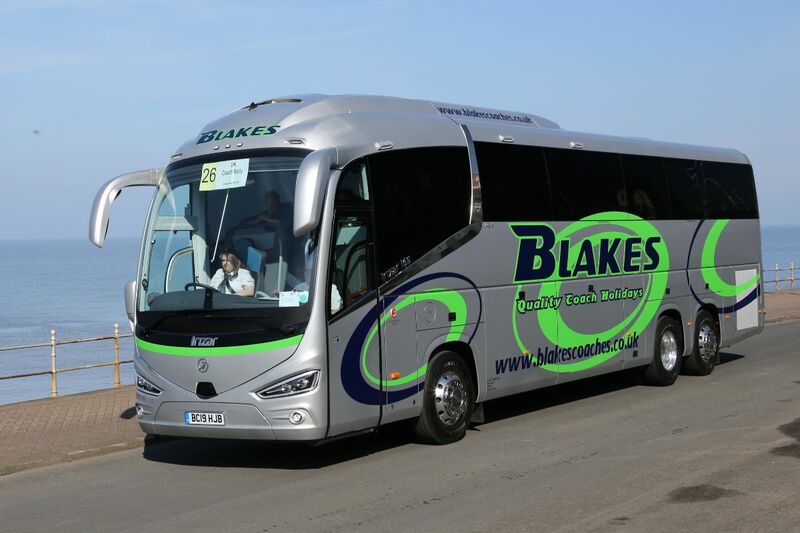 All MD9s now have USB points as standard. 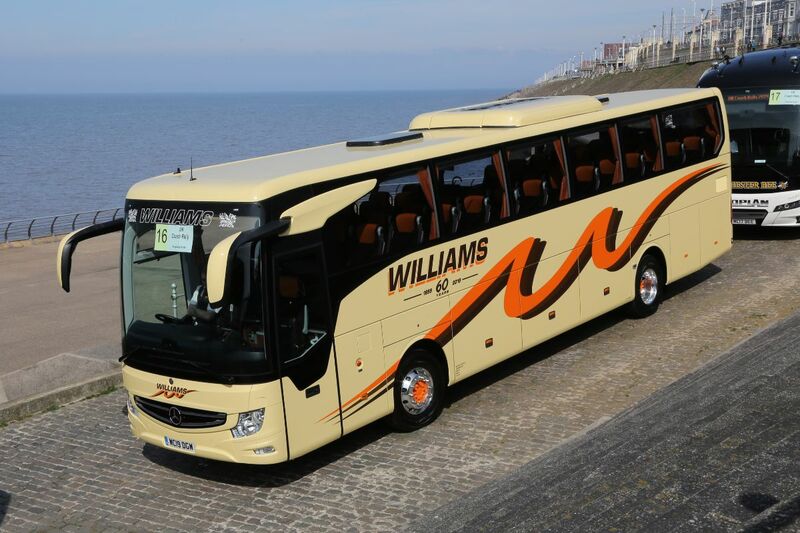 The EX16M was a full executive with 57 recliners and toilet, 408hp DAF Euro6 engine and ZF EcoLife automatic box. 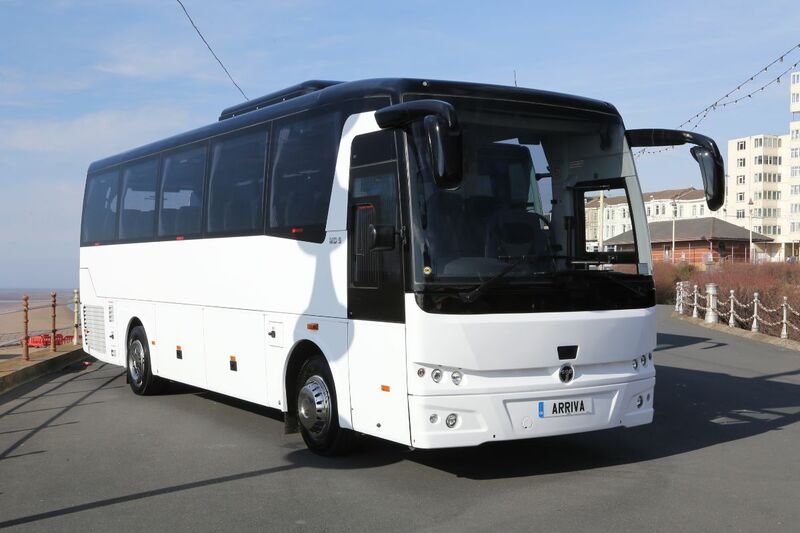 New stock Temsa MD9s and HD12s are currently available along with Van Hool EX15 and EX16 models. 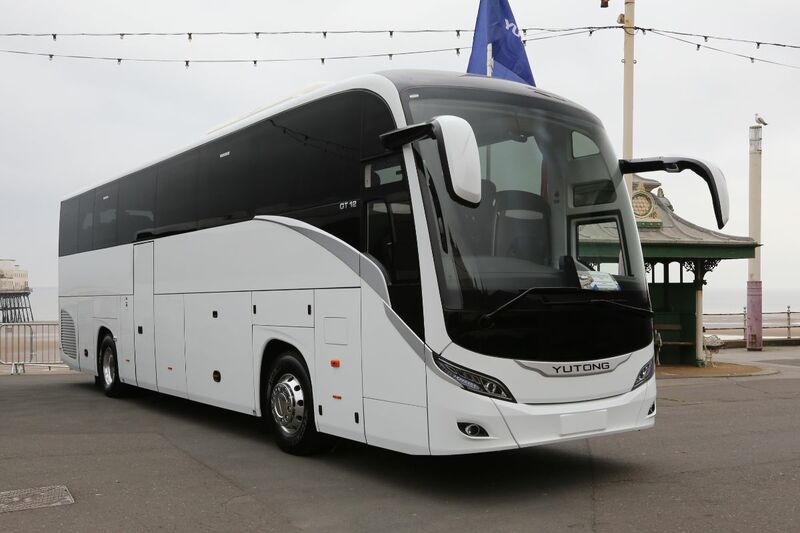 Steve Fletcher reported that they were hopeful of a breakthrough soon in being able to offer a Euro6 conversion of a Euro5 Temsa HD12 following work undertaken in Sweden. 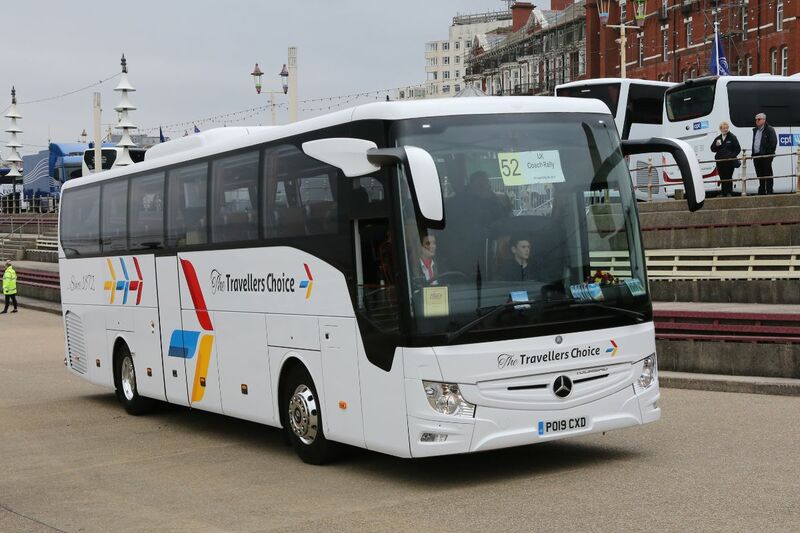 Pelican’s stand featured the Yutong TC9 midicoach in a livery promoting CPT and the new GT12 coach in stock white. 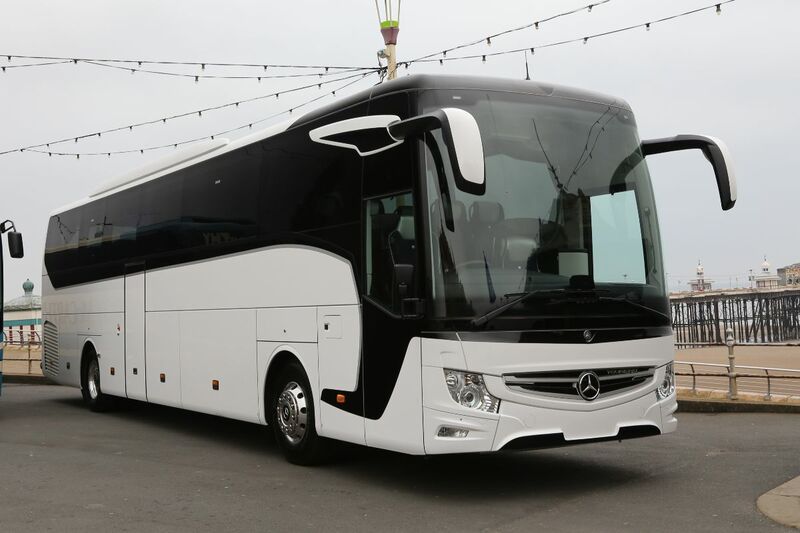 Mercedes-Benz was represented by a two-axle Tourismo demonstrator in white. 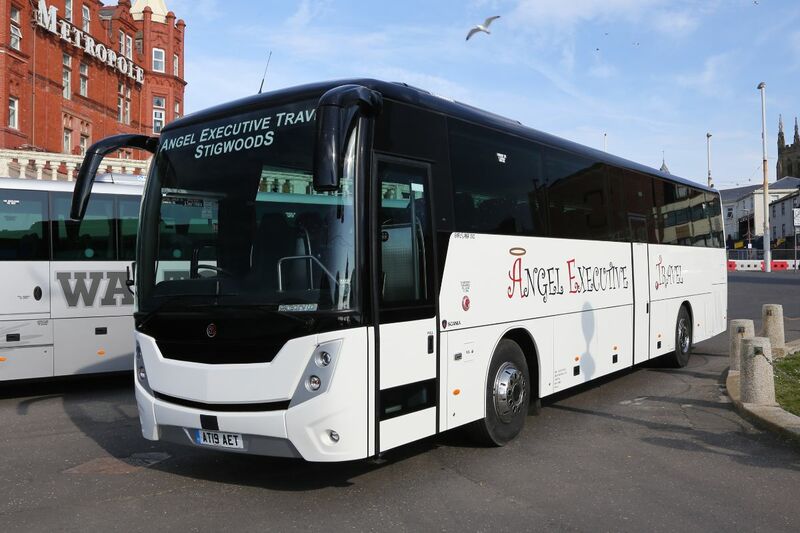 BASE first showed the new Scania mounted version of the MobiPeople Explorer 330 at the NEC last year and this time the coach shown was a 74 seater with centre nearside emergency door for Angel Executive Travel of High Wycombe. 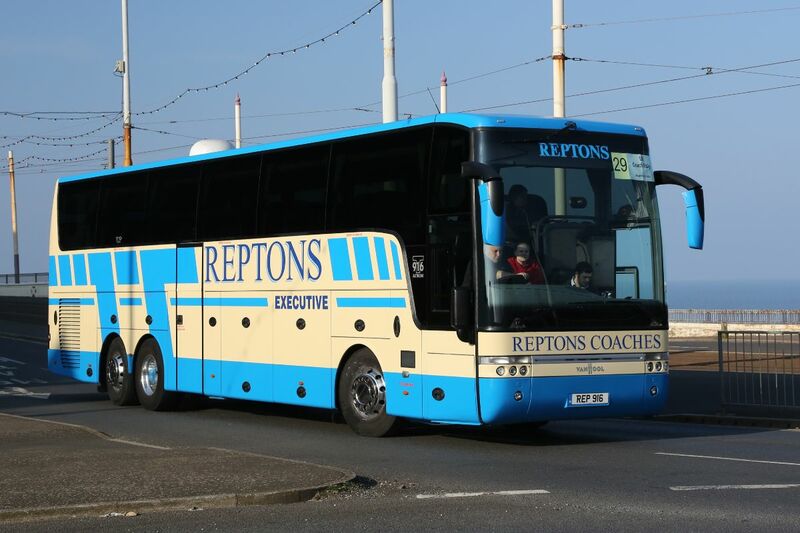 It was accompanied by another Explorer 330 on MAN RR8 chassis for nearby Walton’s of Freckleton. 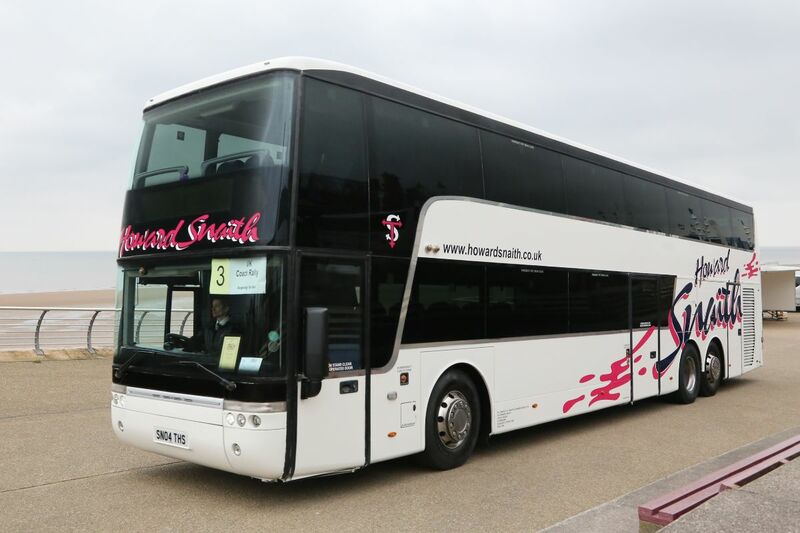 This has a side lift and a capacity of 57 or 27 plus eight wheelchairs, as well as a six cubic metre luggage hold.